Monday snuck up on me this week because of the Memorial Day holiday so I'm a bit late this morning getting my post done. I had a few new additions to the harvest basket last week, both new for the season and entirely new varieties. Buck's Horn (or Buckshorn) Plantain, aka Minutina or Erba Stella, is making a return to my garden after at least a decade. 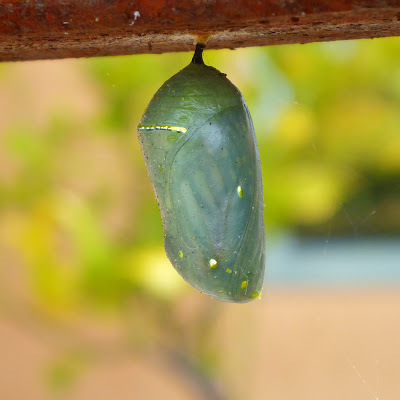 I grew, or tried to grow it in my previous garden and what I remember about it was that the aphids and ants invaded and I never really got to enjoy it. I was reminded of it when our Harvest Monday host Dave wrote a spotlight post about its more wild cousins so I decided to give it a try again. 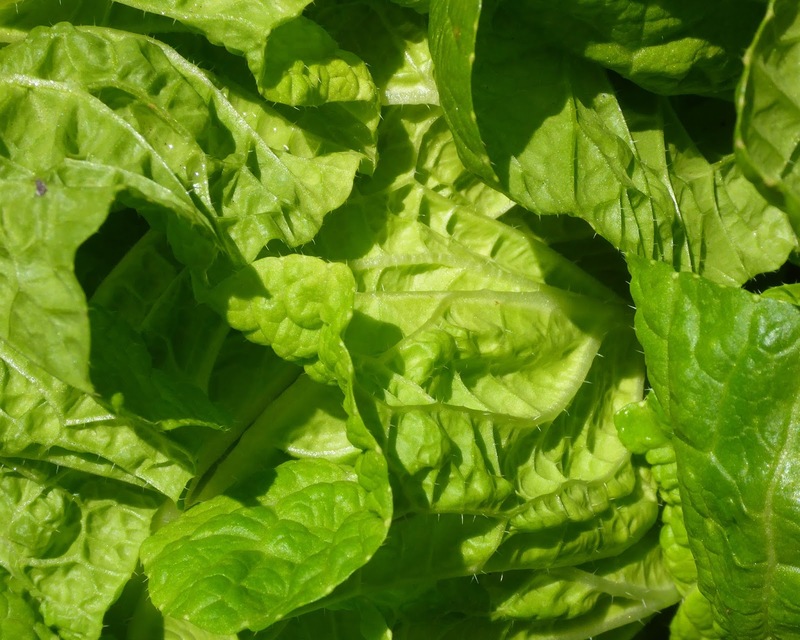 I'm glad I did, the succulent and slightly crunchy leaves have a nice mild flavor reminiscent of spinach and make a nice addition to a salad. 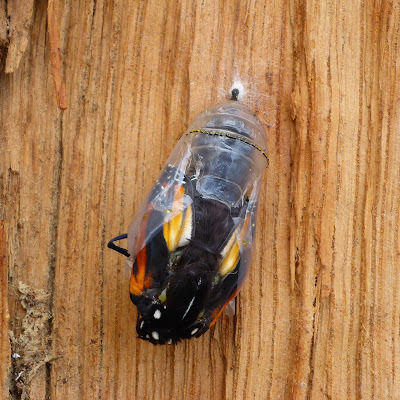 You can read more about it in this informative article from Mother Earth News. 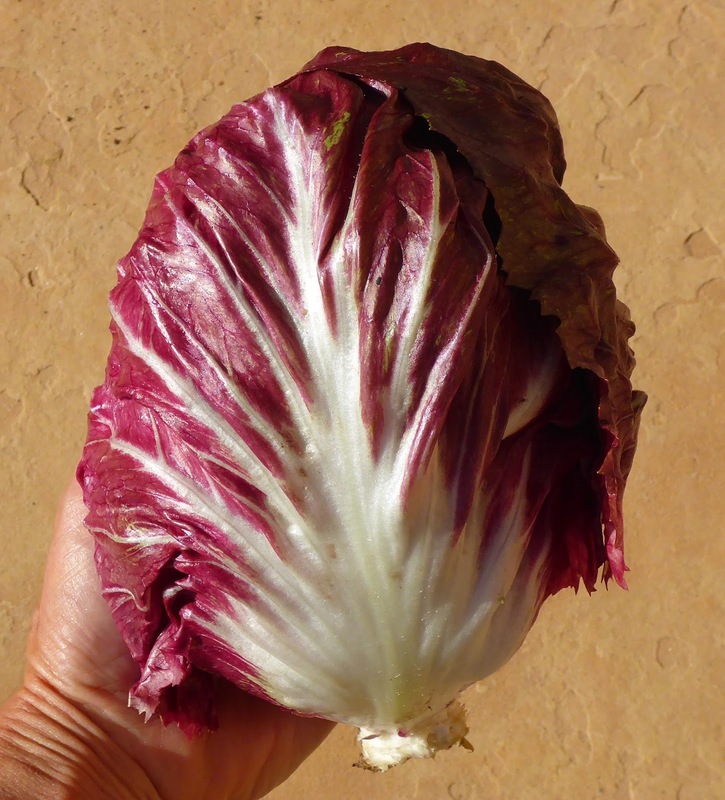 Another new variety in my garden is Palla Rossa Radicchio, Wild Garden Seed says that it is a good variety for spring planting so I decided to test that and at least one of the plants that I set out this spring has made a nice head. It's difficult to tell by just looking at the plant, it just seems to be a big fluffy head of green leaves, but I could tell that there was something in there when I gave the center of the head a squeeze so I harvested it and trimmed it back and found a really nice head. 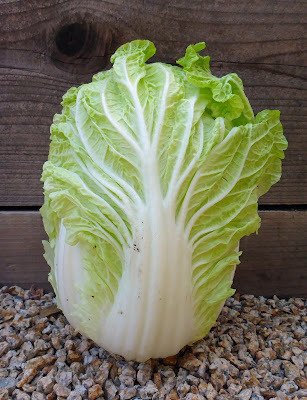 Little Jade Napa Cabbage is returning to the garden this spring. It hasn't been gone long, only a year. 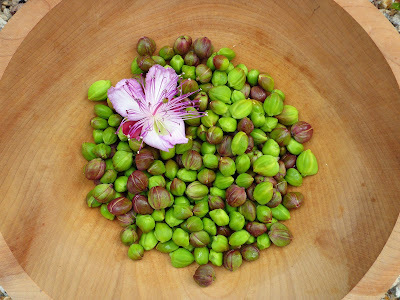 Capers have been in the garden all along but I didn't harvest any last year, so they are making a comeback this spring. 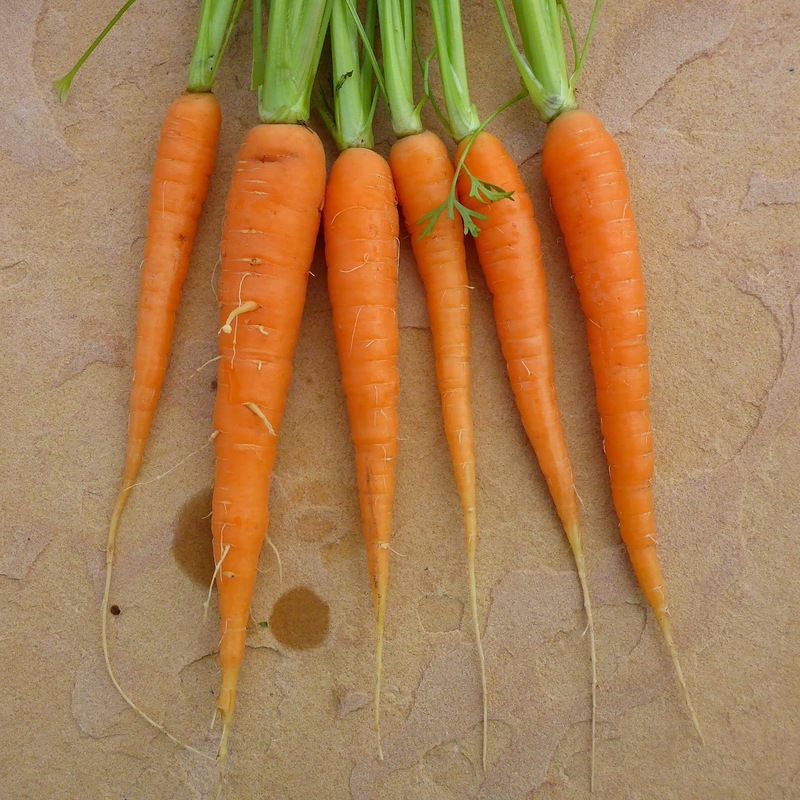 I didn't grow any carrots last year so this spring I made sure to get some going. I'm trying all new varieties. These are the first significant thinnings from the patch. The orange ones in the photos are either Nelson or Bolero, I can't remember which is which. 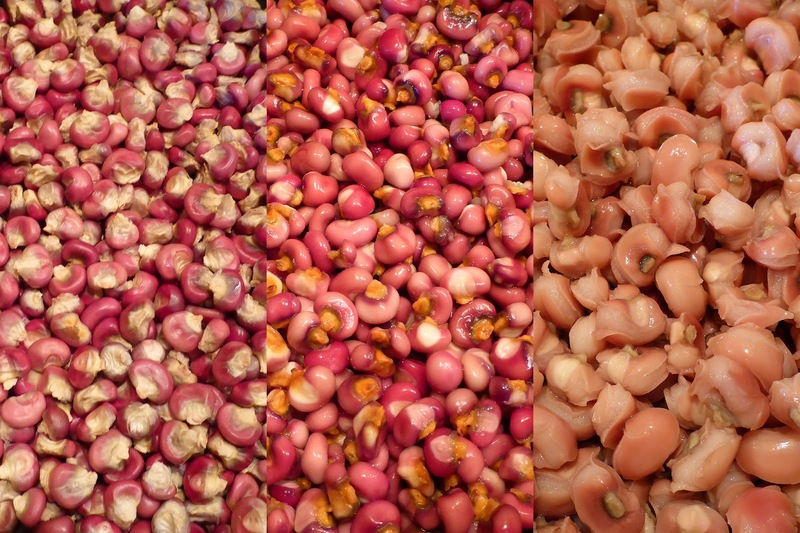 The red ones are Pusa Rudhira Red, an OP variety from India. 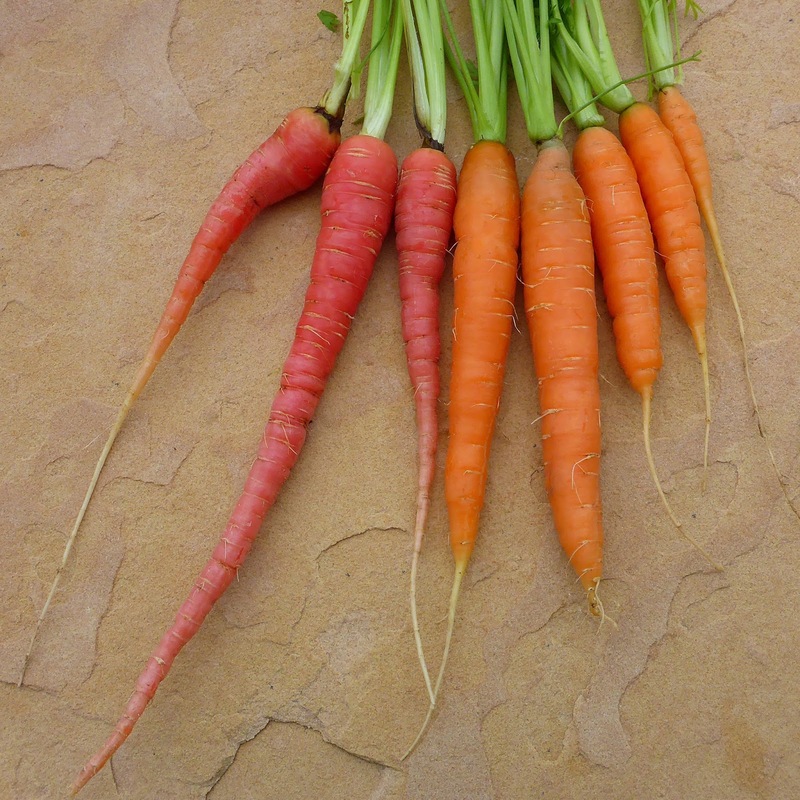 The carrots shown below are supposed to be more Pusa Rudhira Red and also Pusa Asita Black, but none of them came out as expected. 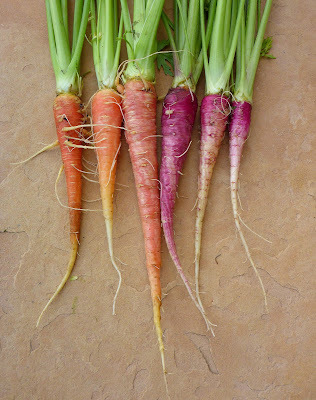 A couple of those red ones came from the patch of supposedly black carrots and the black ones are supposed to be solid black (actually a very dark purple). 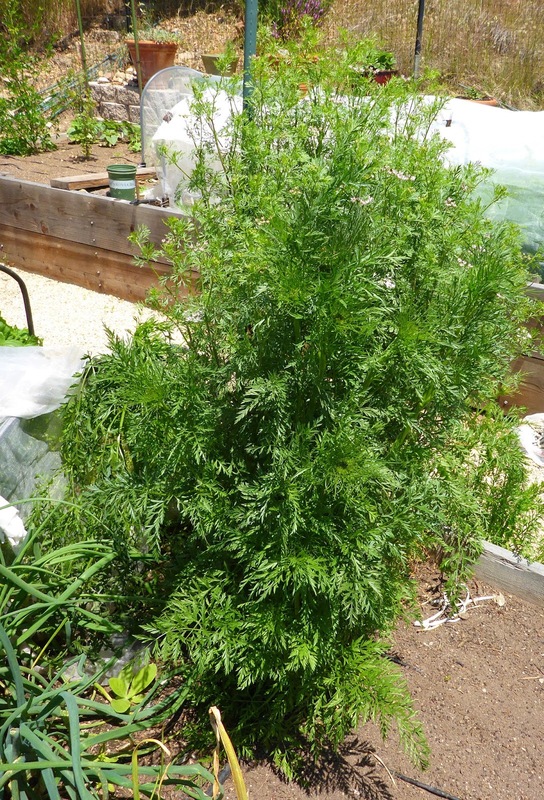 The funny thing about the black carrots is that Baker Creek actually sent a replacement packet of seeds because they found that the seed from the lot that they first sent me weren't true to type. Oh well... They tasted fine, I've been grating them and adding them to my salads. I pulled all of them because they were shading out the one other variety that I'm trying. I pulled a couple of red onions to enjoy. 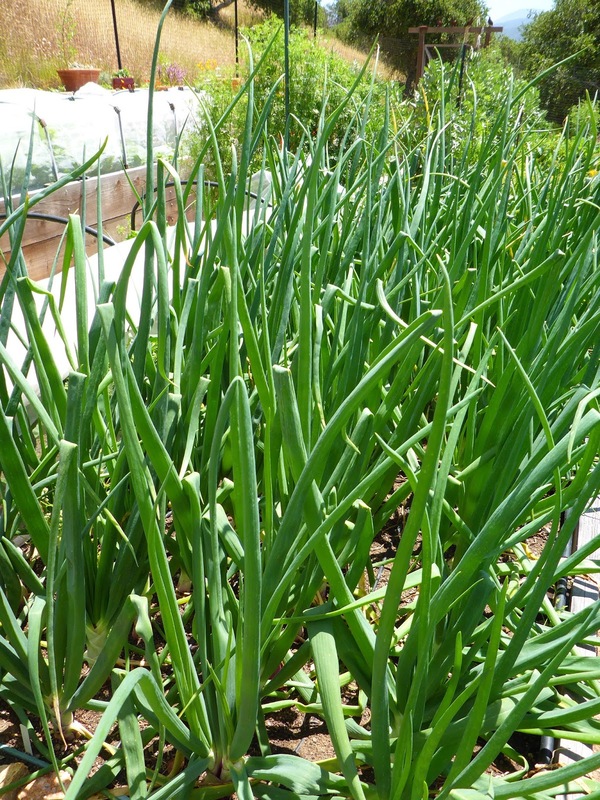 There's plenty of them in the garden and I know that the Rossa Lunga di Firenze onions aren't good keepers so I decided to start enjoying them as spring onions. The Rossa Savonese is new in the garden and I'm hoping it will be a keeper, but one of them had split so I pulled it give it a try. Both of them were really tasty grilled, nice and sweet. I pulled another splitting cippollini onion, this time to use in a batch of Okonomiyaki, the cabbage and scallion pancakes that I learned about from Daphne. 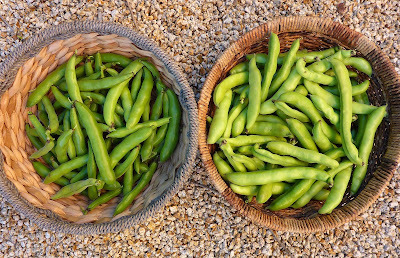 The fava harvests continued. That's the last of the Extra Precoce Violettos shown above. I've already cut down the plants and shredded them for compost. 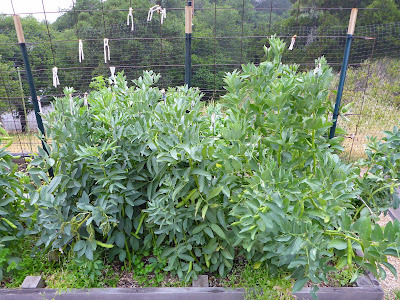 The Robin Hood favas produced a big round of beans and there's at least an equal amount left on the plants. Those are going to all get harvested today, ready or not. 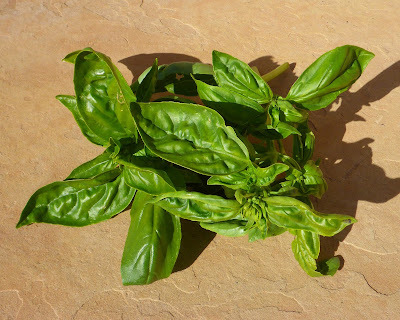 I don't tally my herb harvests but thought I would show some of the Aurelia basil that I harvested. It's a nice sweet variety from Genoa that's supposed to be really good for basil pesto but so far I've just been enjoying it in various dishes. One night we enjoyed it in a topping for bruschetta that included chopped peeled favas, green olives, and feta cheese. 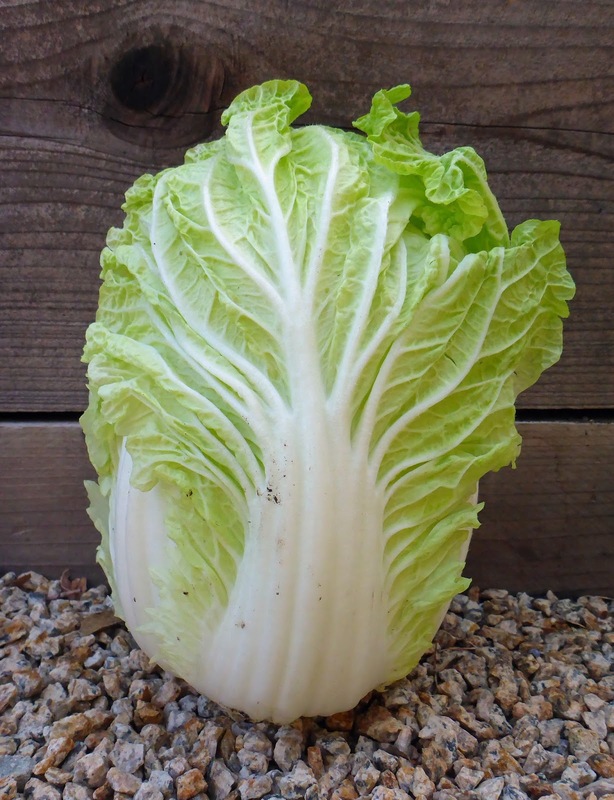 Little Jade napa cabbage - 3 lb., 3.7 oz. 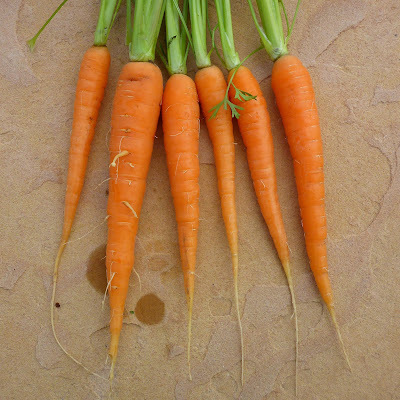 Carrots - 1 lb., 4.9 oz. 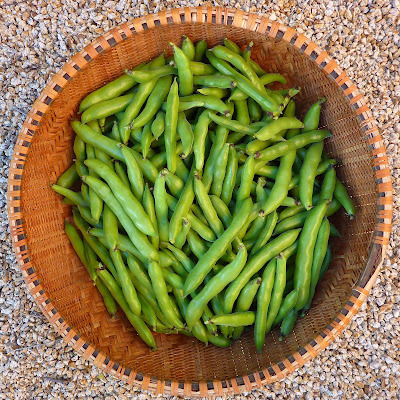 Extra Precoce Violetto favas - 13 lb., 5.2 oz. 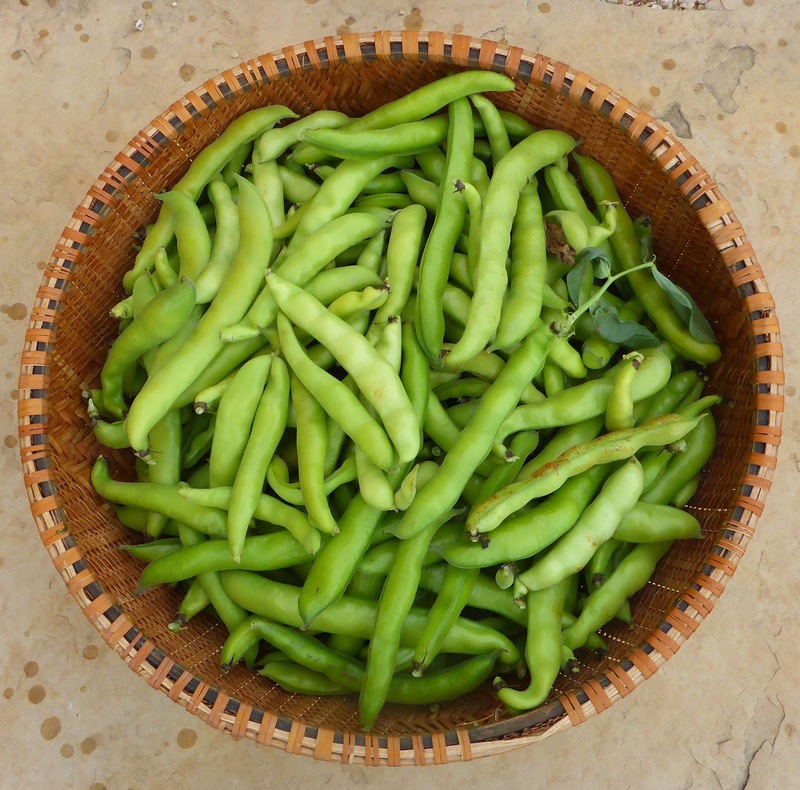 Robin Hood favas - 9 lb., 12.9 oz. 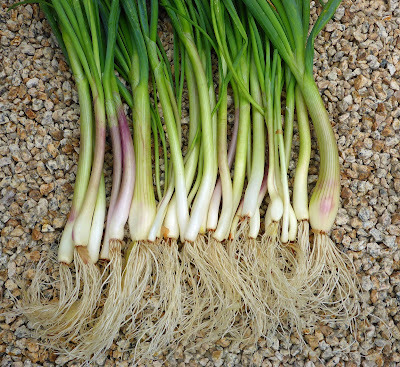 Di Maggio cippollini onion - 13 oz. Rossa Lunga di Firenze onion - 10.9 oz. Rossa Savonese onion - 7.8 oz. Buck's Horn plantain - 11 oz. 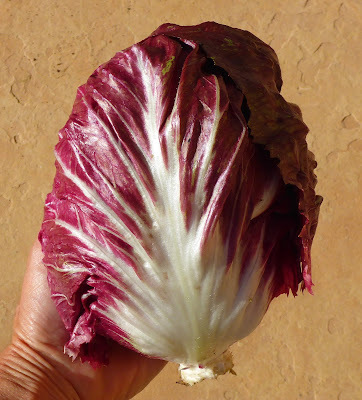 Palla Rossa Radicchio - 13.3 oz. 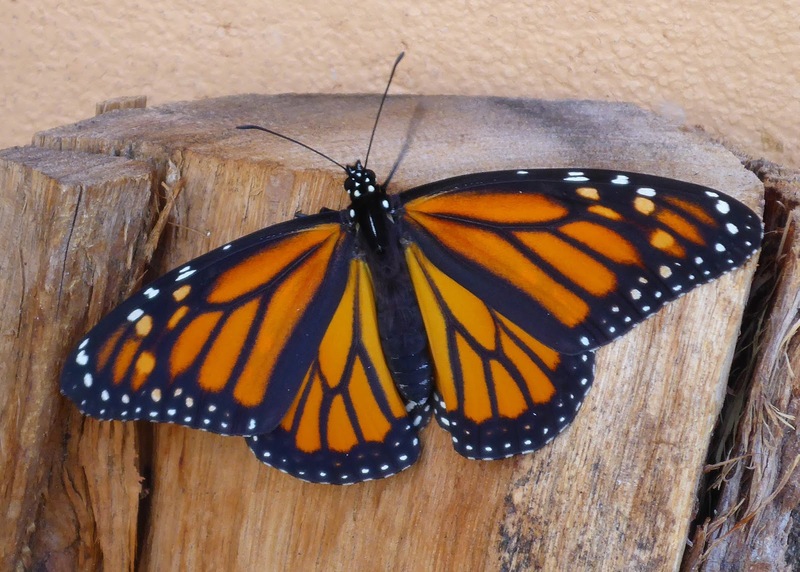 A year and a half back I wrote about finding Monarch Butterfly caterpillars in my garden. 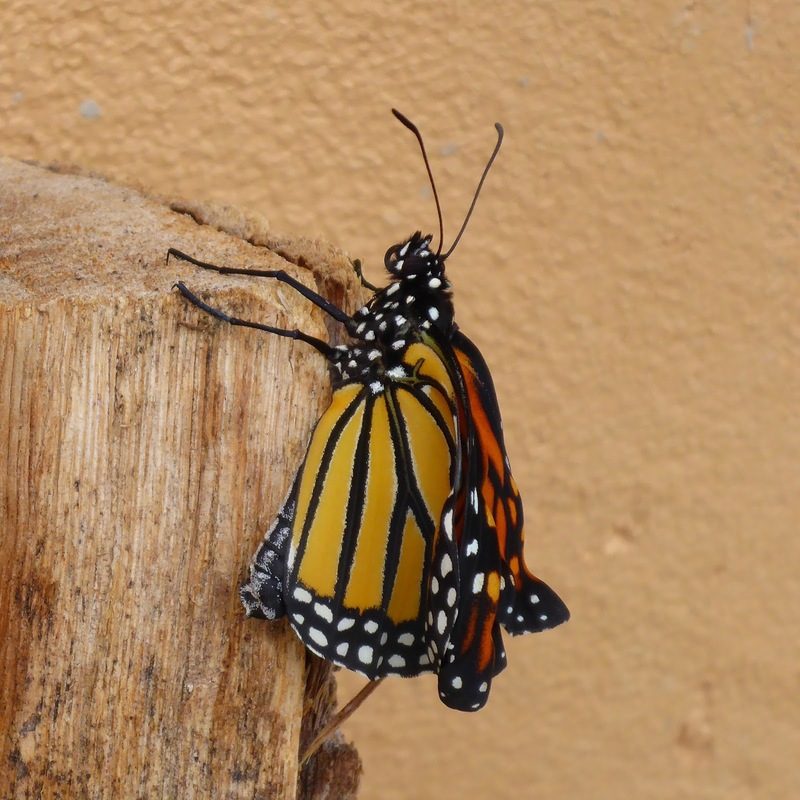 They were chowing down on Asclepias physocarpa, a milkweed that's native to South Africa and that thrives on neglect in my garden. 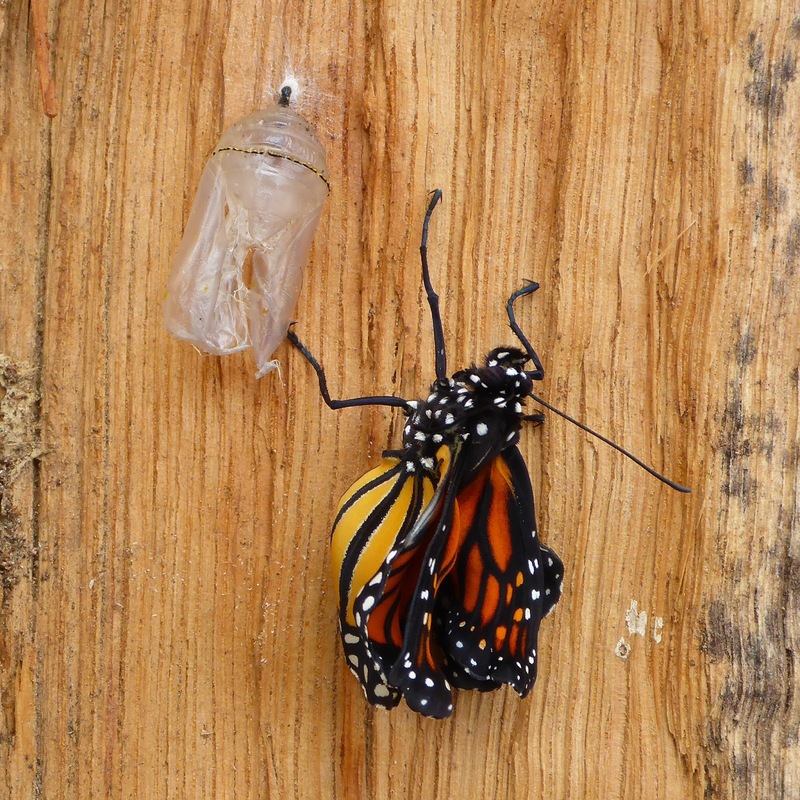 The butterflies returned last fall and laid eggs on the milkweed so I got to watch the munching caterpillars once more. I was disappointed though because I never managed to find any chrysalises. 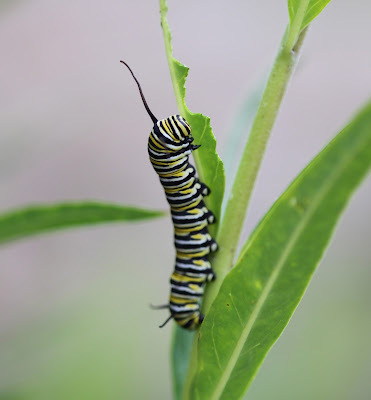 The Monarch caterpillars are back this spring, which is a first, in the past I've only found them in the fall. 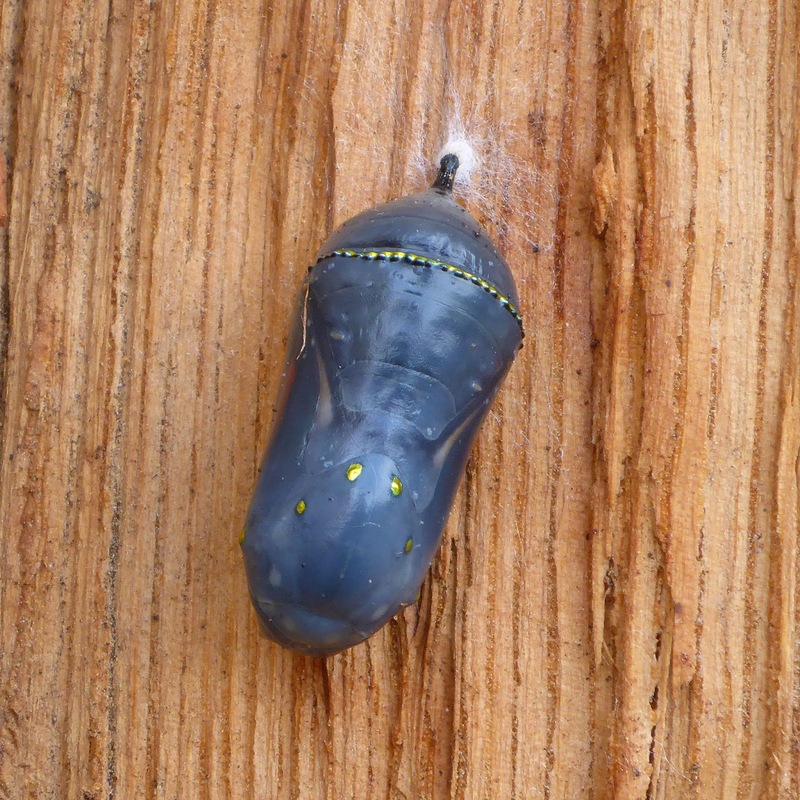 Another first was finding a chrysalis! 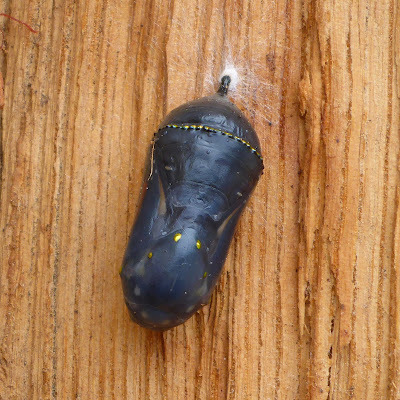 One morning I noticed the dark stripes on the wings were starting to show through the skin of the chrysalis. I kept checking all day long and nothing happened. 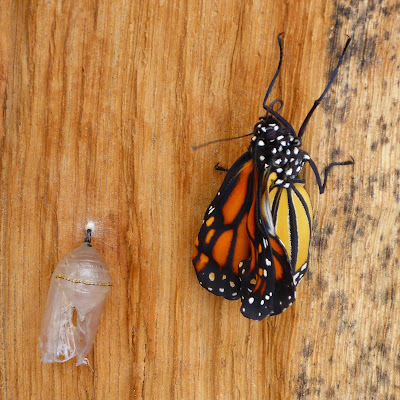 The next day the chrysalis was even darker. 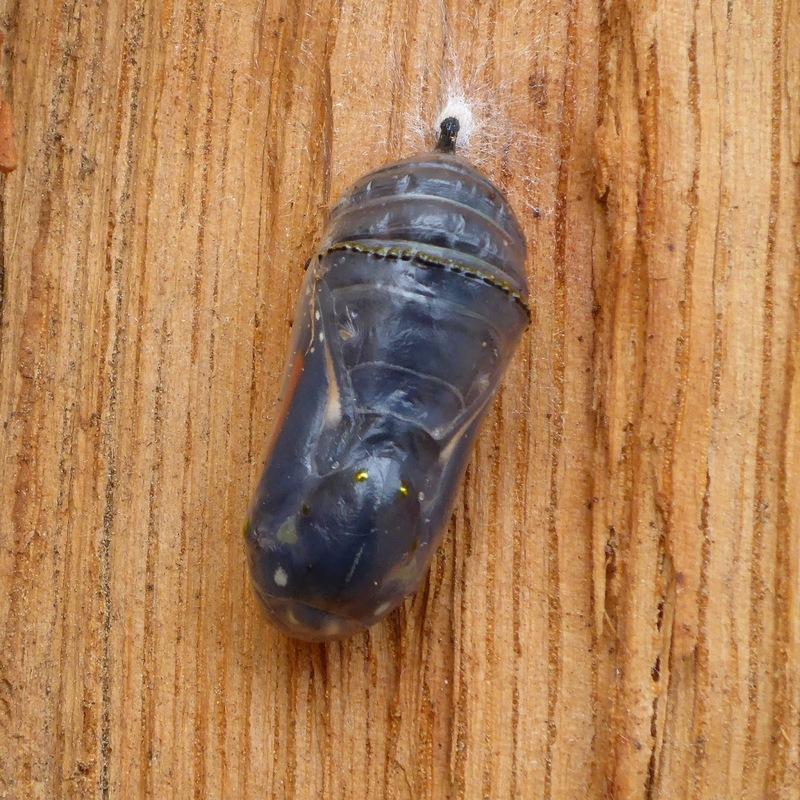 I kept watching but still no action and then I had to leave for the afternoon and when I came home I found an empty chrysalis. Oh bummer! 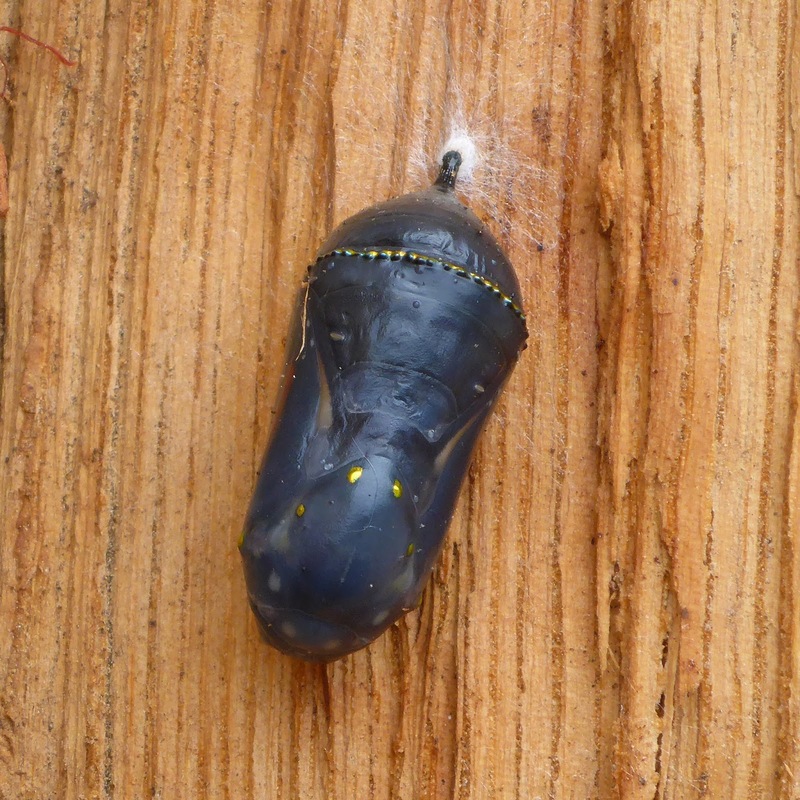 Oh lucky me, I checked just as the chrysalis was starting to split open. I dashed to get my phone so I could take a video and the camera kept snapping. If I can learn how to edit the crappy video that I took I could show the butterfly actually emerging, but photos will have to do for now. Spring harvests continued last week with a bunch of roots, shoots, and leaves. 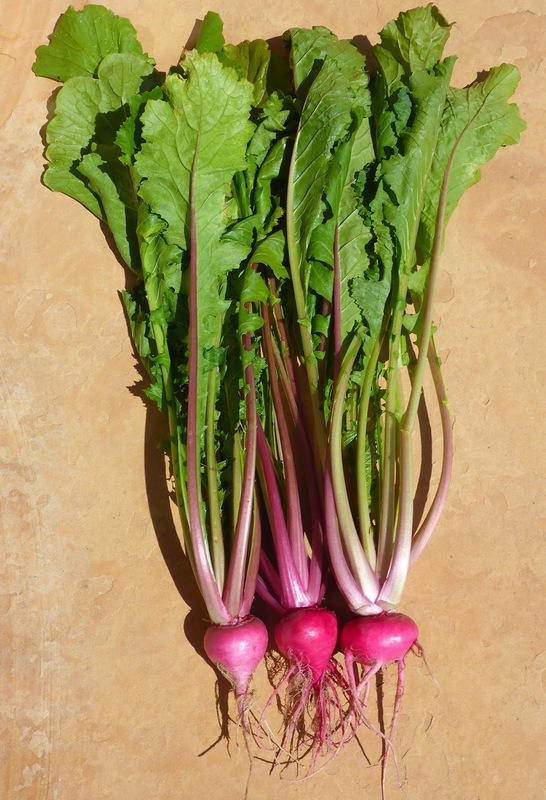 The turnips are sizing up quickly so I pulled all the Mikado and Round Red turnips by the end of the week. 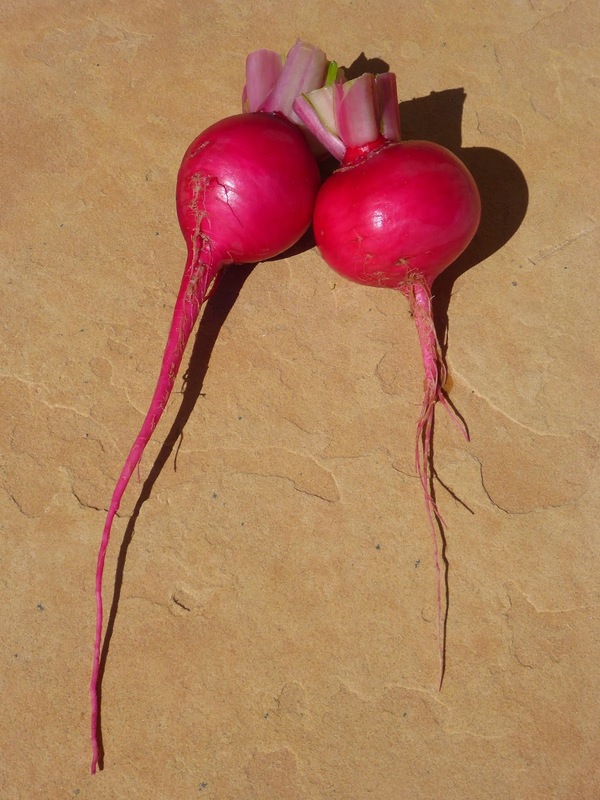 The Scarlet Ohno Revival turnips are just a bit more slow to size up so there's still a few of those left in the garden. 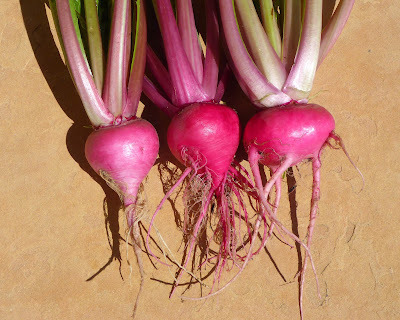 They are larger than the Mikado and Round Red varieties, both in the size of the roots and the leaves. 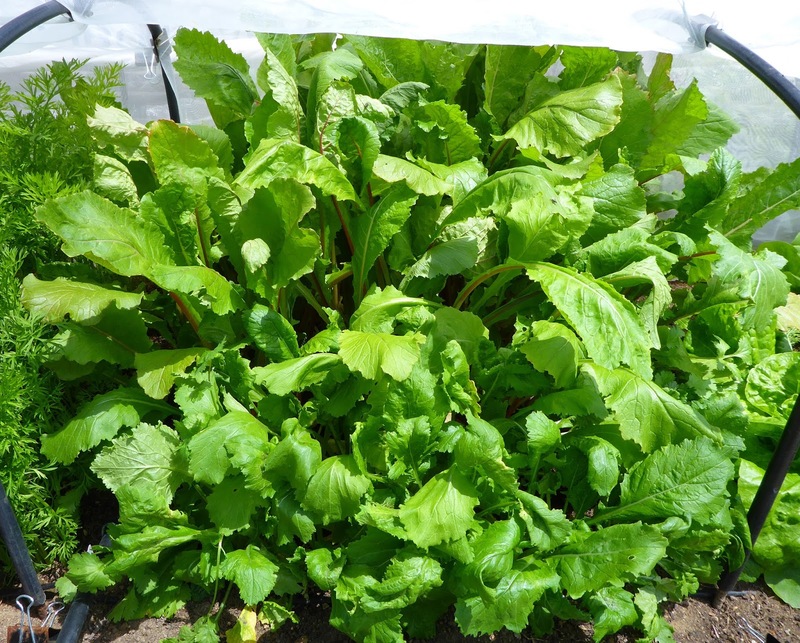 This variety is grown as much for the leaves as the roots, indeed, Wild Garden Seed lists it under Mustard Greens rather than roots. 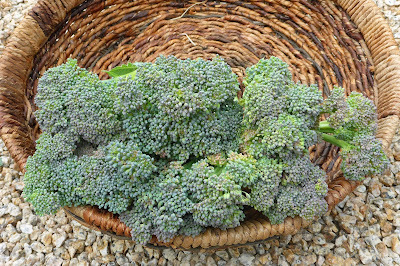 I used the leaves from this bunch with the Round Reds and Mikados shown above in a stir fry with broccoli and a spring onion and some shredded leftover roast chicken added at the end. I used a green Thai curry paste and coconut milk for the sauce. Dave loved it, which was a bit of a surprise since he usually just tolerates mustardy type greens. It's a good thing I cleared out the turnips, you can see that some critter was starting to tunnel through some of the roots. 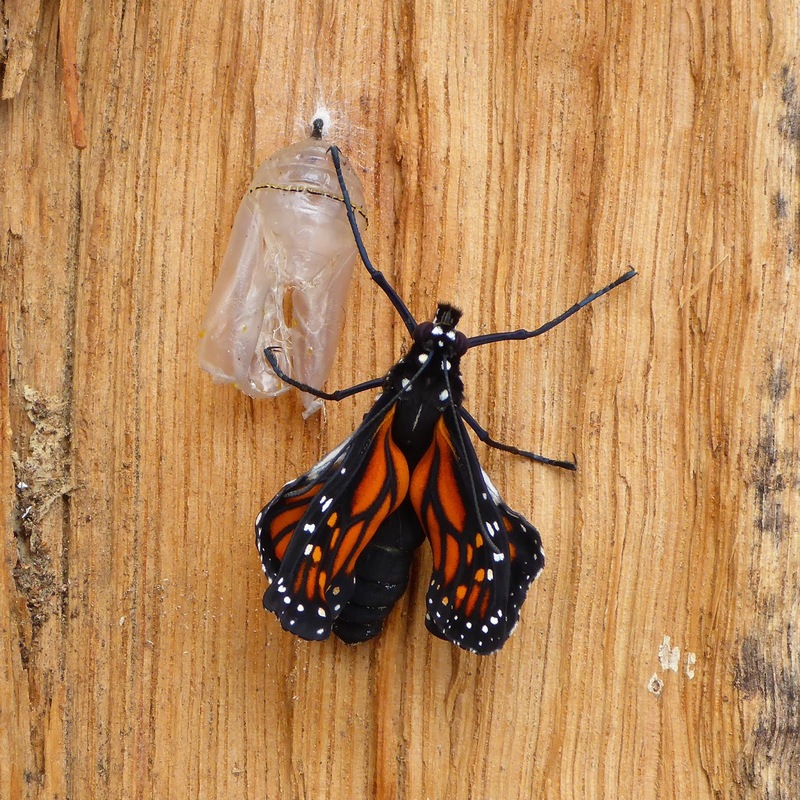 I'm not sure what the pest is or what to do about it, but fortunately it had found only a few roots. The favas are still rolling in. I harvested earlier in the week last week so the totals were less than the week before. There's at least one good harvest of the EPV's left and the Robin Hood harvests haven't really come on strong yet. I got side shoots from one of the Batavia broccoli plants and main heads from the Apollo brokali plants. I pulled a clump of green Zebrune shallots which was all the extra plants that I didn't have room for at planting time, rather than tossing them out I just bunched them together and plopped them in one spot. 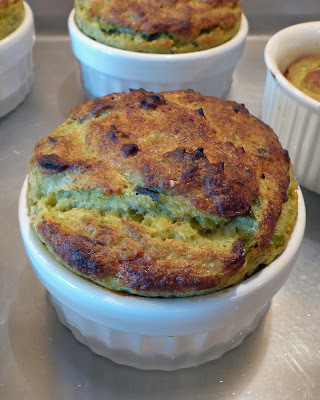 I ended up with 1.5 pounds of green shallots, most of which I used to make another version of a pudding soufflé. 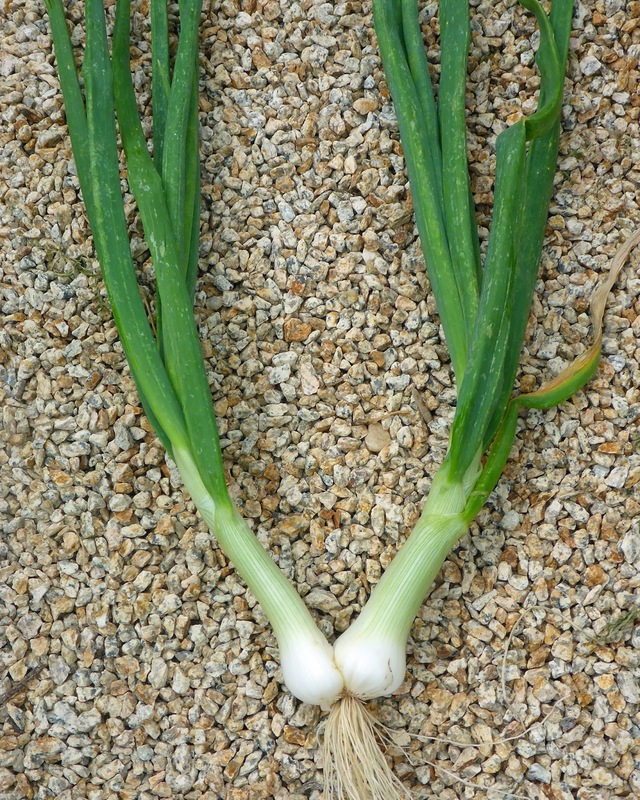 I may be snitching more green shallots from the main planting, they are very aromatic and delicious. 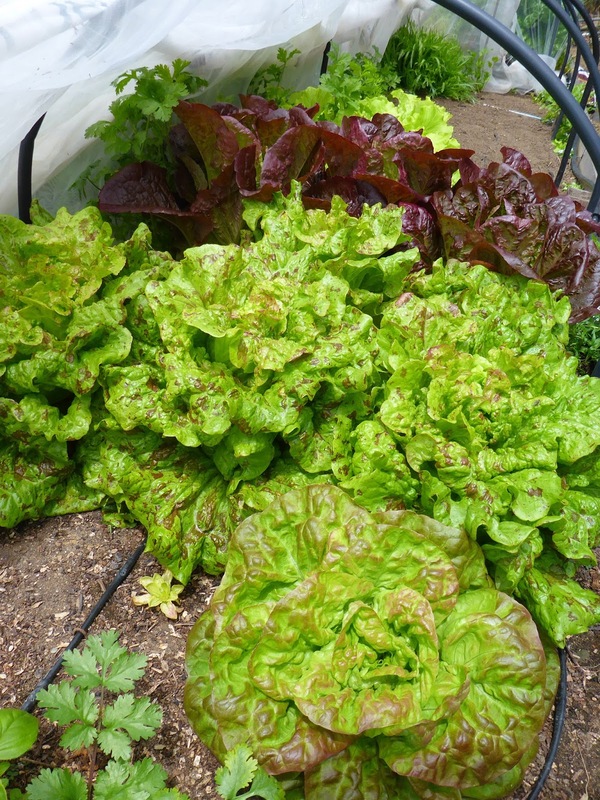 The spring lettuces are getting to be huge and I can't keep up with the harvests. 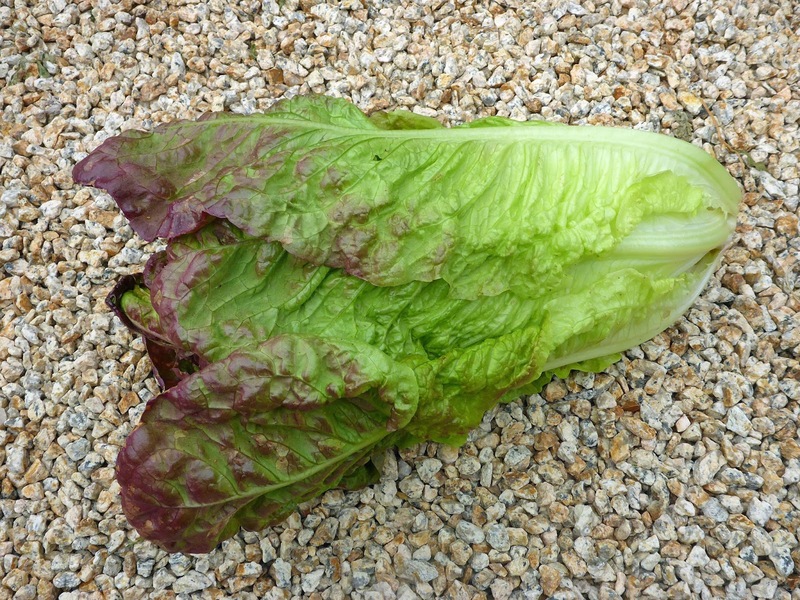 Here's a big Red Butter Romaine. 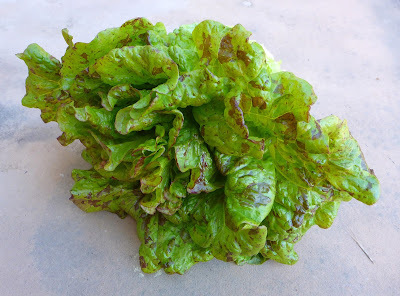 I need to figure out a way to turn a lot of lettuce into a little bit of something, soup maybe? 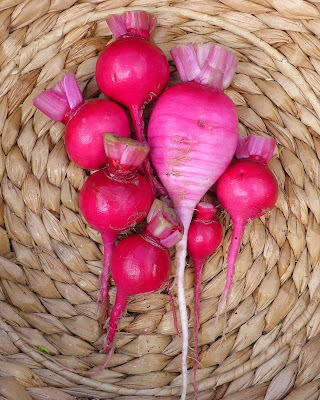 I had one harvest earlier in the week when I didn't have time to do a photo shoot, so I don't have any photos of a big bunch of Mizunarubasoi and some more radishes. 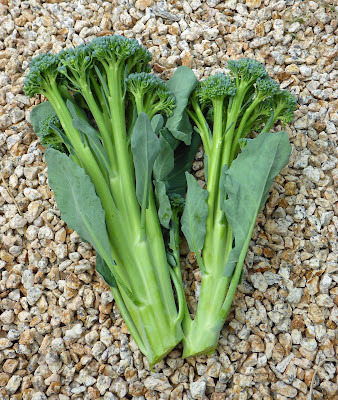 Batavia broccoli - 15.6 oz. Apollo brokali - 9.8 oz. Extra Precoce Violetto favas - 3 lb., 2.9 oz. Robin Hood favas - 2 lb., 2.9 oz. 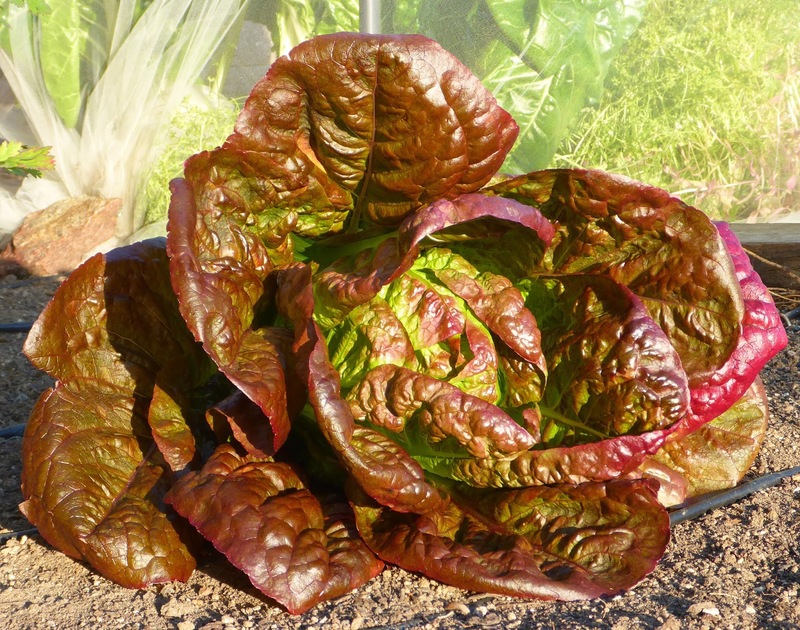 Red Butter Romaine lettuce - 1 lb., 3.2 oz. Mizunarubasoi - 3 lb., 1.6 oz. 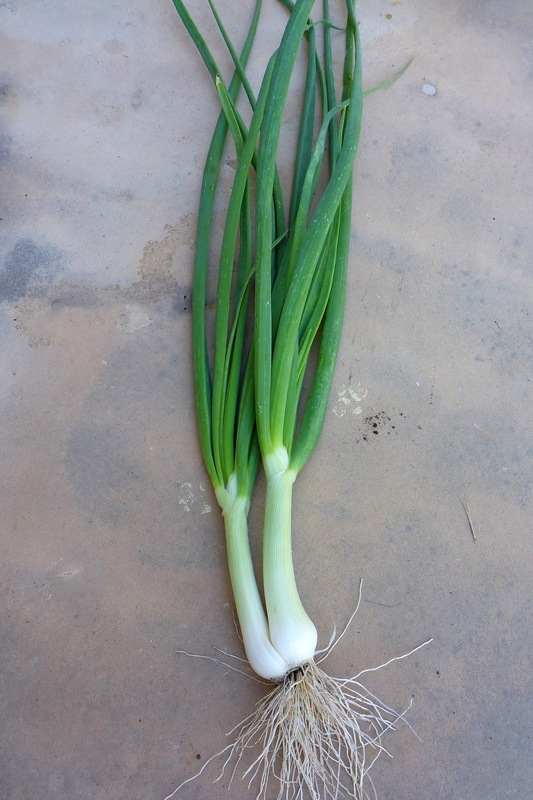 Di Maggio cippollini onion - 12.3 oz. 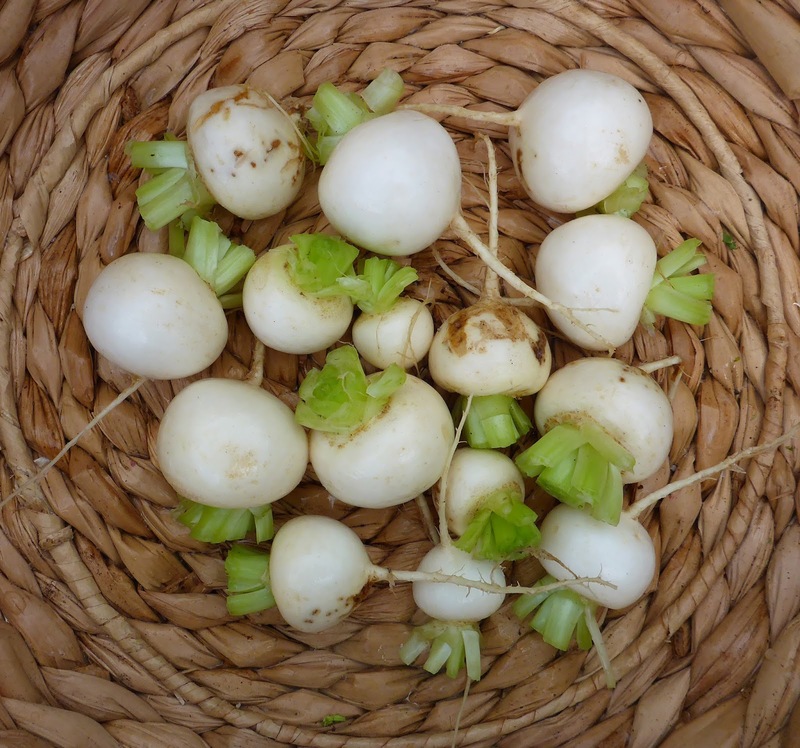 Helios radishes - 17 oz. Malaga radishes - 10.7 oz. 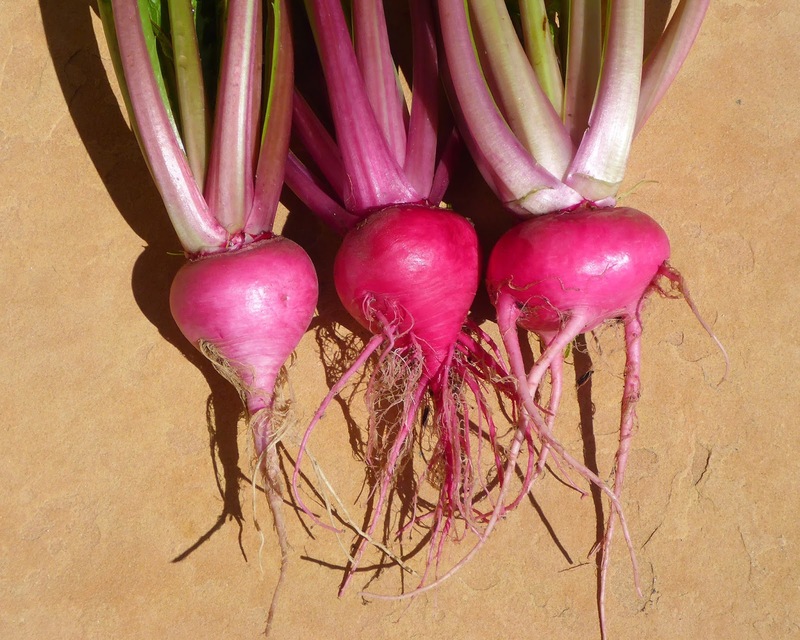 Pink Punch radishes - 3.8 oz. 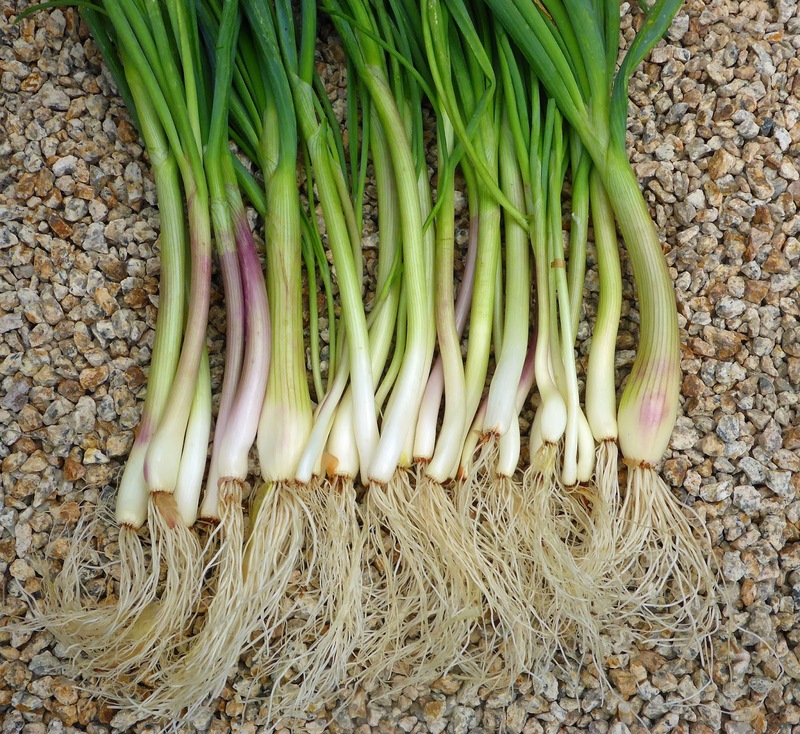 Zebrune green shallots - 1 lb., 8 oz. I don't have much variety to show this week, mostly because I'm working my way through previous harvests that are in the fridge. 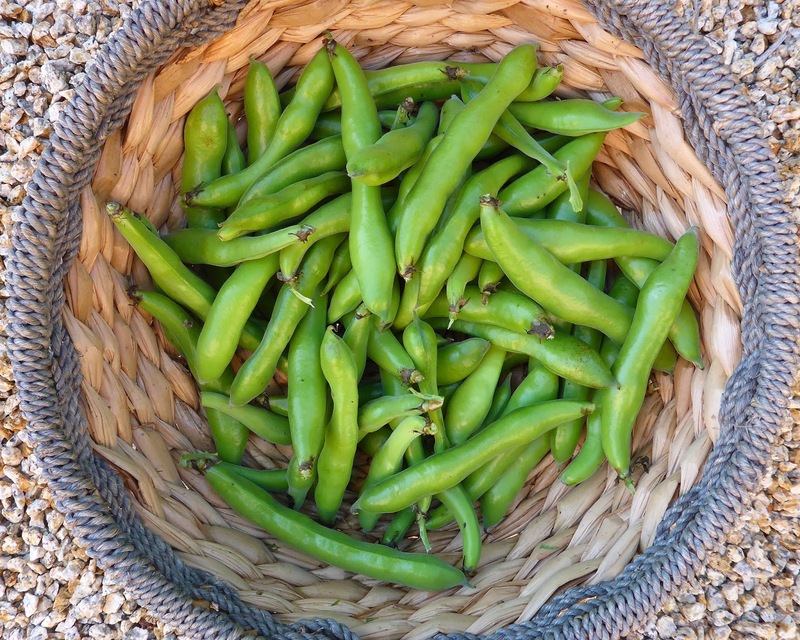 The favas had to be picked before they grew to be too big and starchy. 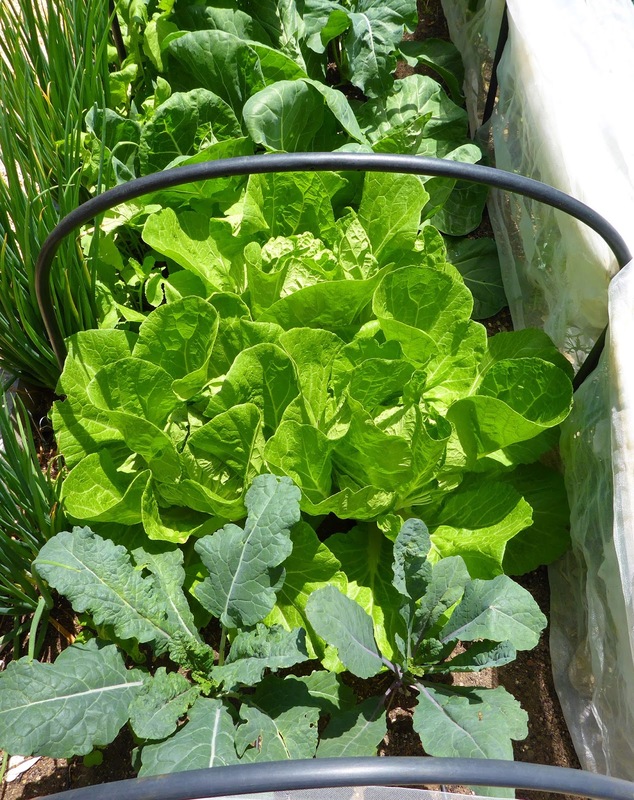 This is one of the few vegetables that I intentionally grow more than I need for fresh consumption. 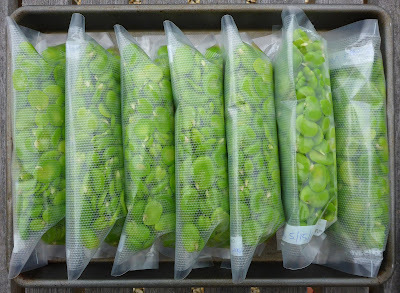 Blanched and peeled favas freeze incredibly well and keep for a long time when they are vacuum packed so I like to grow lots of them to last through the year. 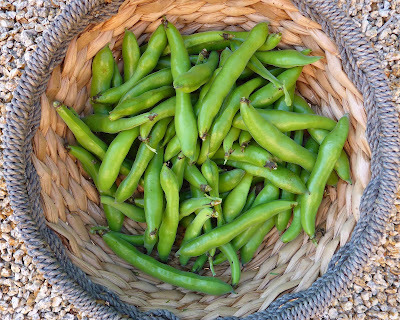 I picked a big basketful of Extra Precocoe Violetto favas and a small basket (less than full) of Robin Hood favas. The Robin Hood beans are still sizing up on the plants. It will nice in a way to have them coming in after the EPV's, it will extend our consumption of fresh beans. That big basketful of EPV favas was reduced to 7 individual half-pound bags of peeled beans here shown ready for the freezer. I pack them into the bags and freeze them before vacuum sealing the bags. Freezing before sealing keeps the machine from sucking the moisture out of the bags which would create a big mess. The cippollini onions don't seem to be inclined to produce the little flat onions that I was expecting so I didn't feel bad about pulling one of them that was splitting into 2 stalks when I wanted some fresh green onions for another batch of Green Quinoa Pilaf (this time made with chard instead of spinach). I am afraid that the Joker crisphead is inclined to bolt rather than produce some full heads so I harvested another one. 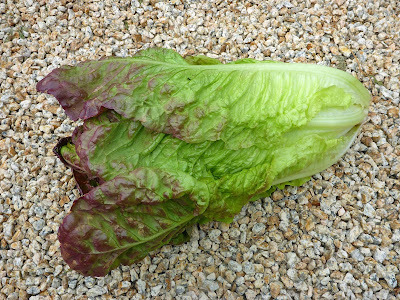 And the same goes for the Red Butter Romaine. 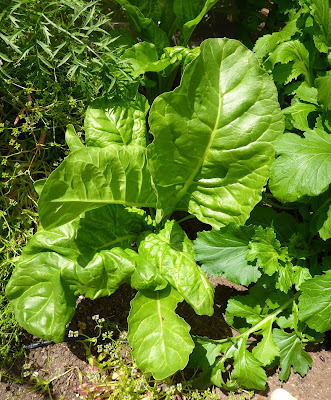 Everything grows so quickly at this time of year, I really need to try to grow fewer heads of lettuce at a time but at more frequent intervals. 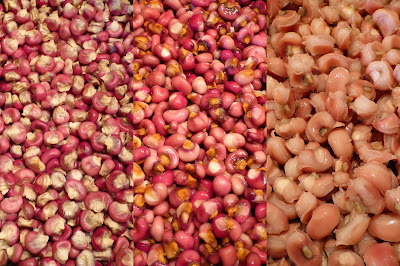 I made another batch of posole from some of the Mandan Parching Lavender corn that I grew last year. I'm getting more comfortable with the process and actually finding it to be rather easy now. I wrote a post about the process last September that I think made it seem like a rather daunting task, and it was difficult to sift through the various methods that I found and settle on the process that worked for me. Really, it's not much more difficult than cooking dried beans, requiring just a few more steps and more patience. First an initial gentle cooking with some lime (calcium hydroxide), an overnight soak in the lime solution, a thorough rinse, and then a long gentle simmer. The posole was served with a beef stew that I slow cooked in a red sauce made from dried New Mexico type chiles that I grew a couple of years ago and that green quinoa pilaf. 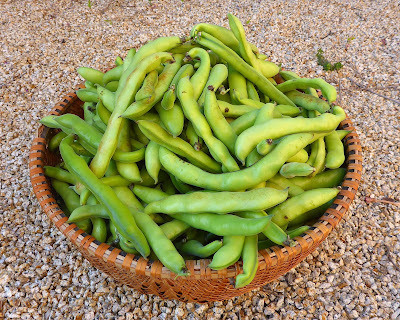 Extra Precoce Violetto fava beans - 17 lb., 11.5 oz. Robin Hood fava beans - 2 lb., .9 oz. Joker crisphead lettuce - 1 lb., 8.1 oz. Red Butter Romaine lettuce - 15.4 oz. 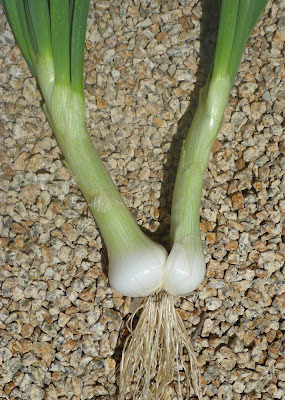 Bianco di Maggio cippollini onion - 11.1 oz. Total harvests for the week - 22 lb., 15 oz. 2016 YTD - 178 lb., 12 oz. I have a confession to make, I've been neglecting my blog in favor of Instagram. It's just so easy to post a single photo with a bit of an explanation. A blog post requires a bit more work - more photos, more commentary, more inspiration, less laziness. 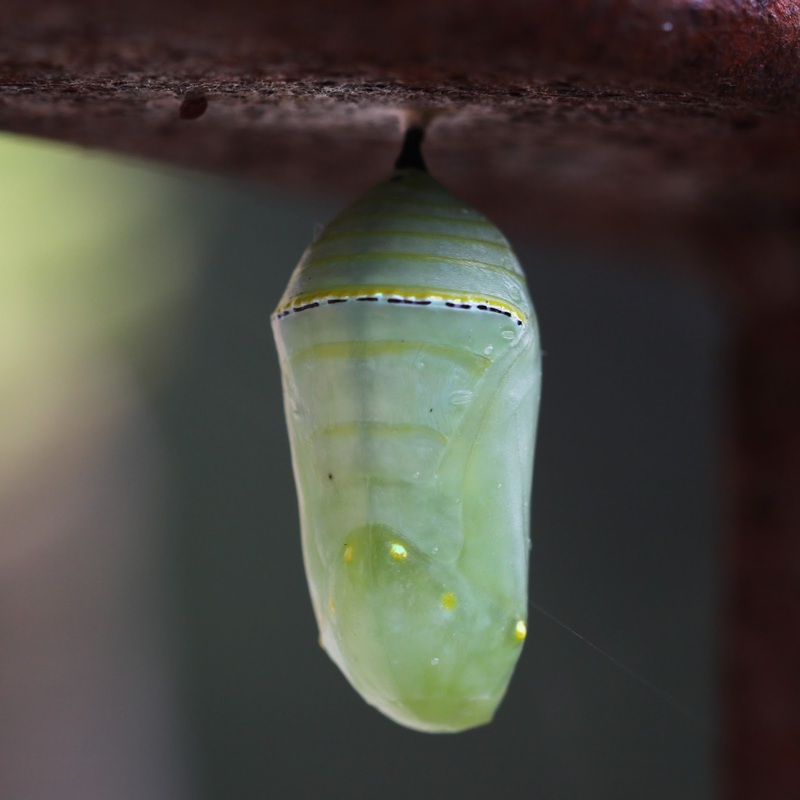 And then there's that instant gratification of seeing likes popping up... With the blog you publish a post and if you are lucky you get a few comments and then you wonder if there's anyone out there reading and perhaps liking what you've put out there, sometimes it feels like tossing it out into a void... 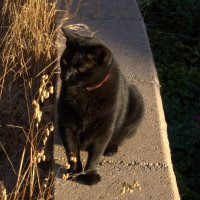 I've also found it easier to find like minded garden Instagrammers by looking through various garden related hash tags. There's lots of veggie gardeners posting to IG who don't blog. 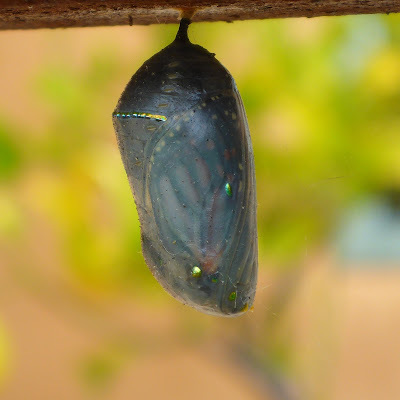 But I'm not ready to abandon my blog yet, nor am I going to stop reading my favorite blogs, I still like to go back and peruse my garden tour posts from the past to compare with what's happening in the present. 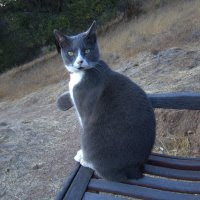 And the blogs that I like to read have far more substance to them than your average IG offering so I will be sticking around so long as my fellow bloggers keep posting. So let's see what's happening in the garden in early May as the spring garden is going full tilt. I'll start with a look down from the hillside above the garden. This is the north end of the garden where beds #1 (foreground) and #4 are. 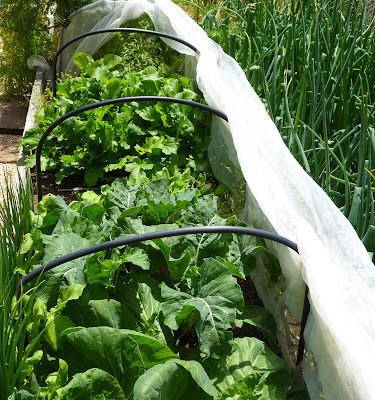 I'm using mesh tunnels as the default whenever I plant out any tender greens because the birds just always seem to find the goodies. I also adopted Daphne's use of tulle fabric for smaller areas or plants that are too tall to fit in a tunnel. 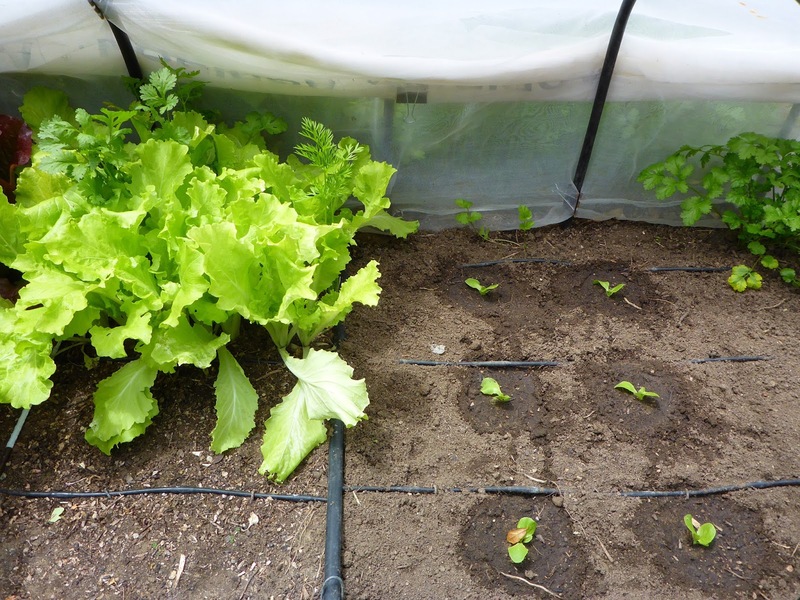 Bed # 1 is where I'm growing mostly salad fixings. Bed # 4 is where I'm growing brassicas for the rest of the year through the winter. 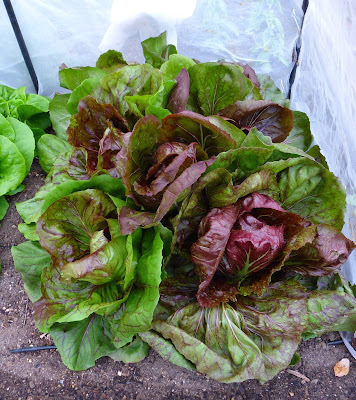 Other vegetables that are long term growers or will be grown to overwinter are also destined for that bed. And it's also home to various alliums until they mature in the summer. 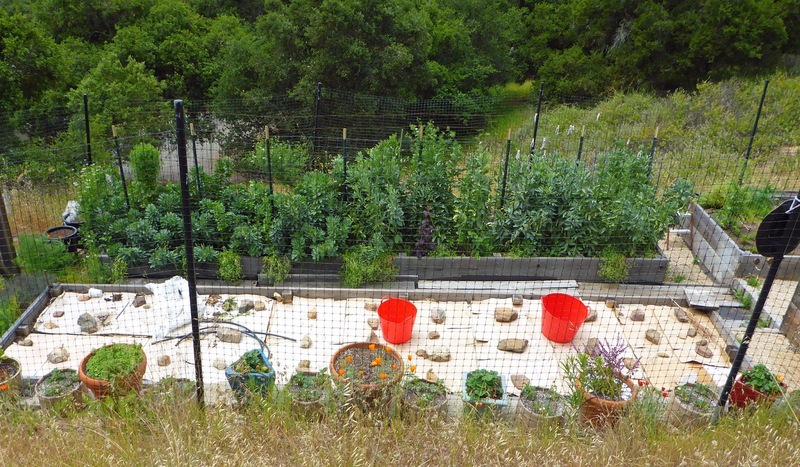 Beds #2 (foreground below) and #3 are on the south end of the garden. Bed #2 will be where the tomatoes and peppers will be growing. 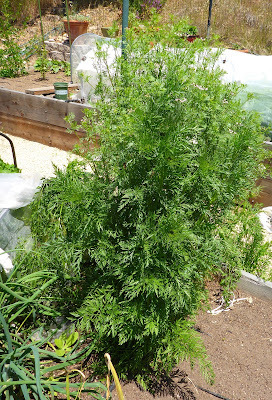 I grew a cover crop of mustard, peas, and other things earlier this year, then chopped them down and dug them in. The I spread compost over the surface of the soil and covered it all with a layer of first paper and then cardboard. I've got the drip system turned off in that bed to keep it from getting waterlogged. 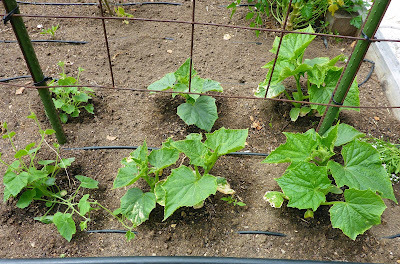 The plan is to uncover it at the end of the month, dig in some amendments, move the trellis that runs the length of bed #3 to bed #2 and then set out the tomatoes along the trellis and the peppers on the other side of the bed by the first of June. I'm not sure that the favas currently running along the left side of the trellis will be done by then though so I may have to invest in a new trellis. You can see that the favas on the left are shorter and bushier than the ones on the right. Those are Robin Hood, a dwarf English variety and the ones on the right are my old favorite Extra Precoce Violetto (Extra Early Purple). Robin Hood is supposed to be early but it's at least two weeks later than Extra Precoce Violetto. Let's take a closer look at Bed #1. 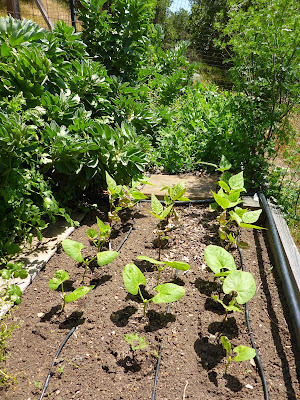 I planted out some cucumbers a few weeks ago but they are growing very slowly, the weather hasn't been all that warm for the most part, it's been mostly cool with a fair amount of fog and even a touch of rain. 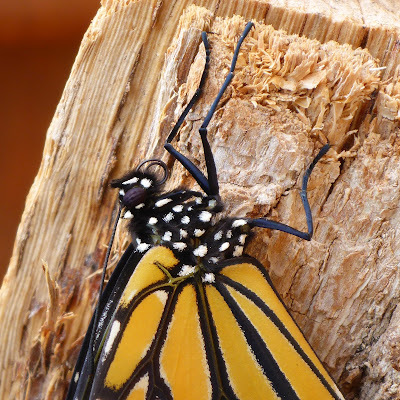 There were a few days when the temperatures actually passed the 80ºF mark, but those have been the exception. These are the chard plants that I started last fall and planted out late. They pouted through winter, remaining small, I thought I had stunted their growth by leaving them in little pots too long and getting them into the garden when the weather was too cold. Wow, did they surprise me, they've been growing like weeds since the days got longer and warmer. The Italian Silver Rib plants are on the right and that photo was taken 1 day after harvesting 5 pounds of leaves. 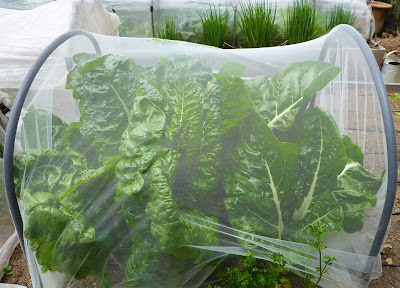 I've been keeping them covered with tulle to keep the birds from feasting but the fabric is also keeping the leafminers out. The spring lettuces are growing faster than I expected, as usual. Salad days ahead! I nearly killed the Tokyo Bekana napa cabbage trying to treat an aphid infestation, but it rebounded, just in time to bolt. They were meant to be salad greens while I waited for lettuce. I'm still working on figuring out what to grow when. 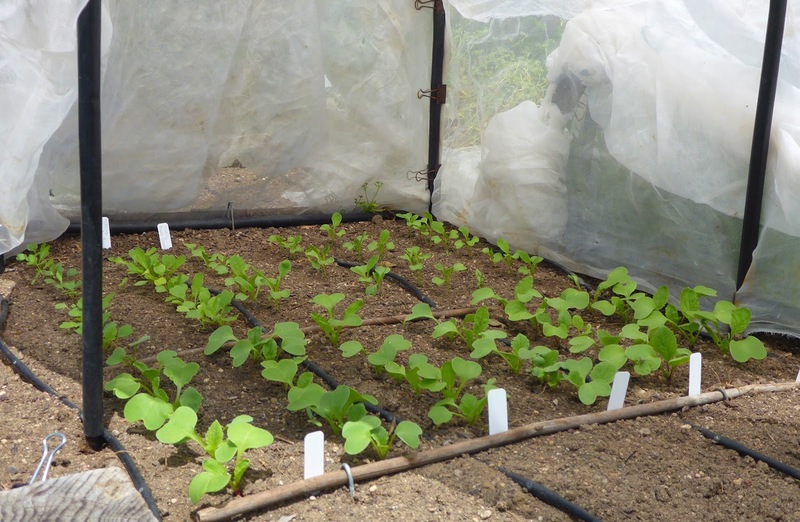 The little seedlings are Manoa butterhead lettuce, a variety from Hawaii that is adapted to heat. If we get some actual summer weather in the next 4 to 6 weeks that could be a test for how well they might do when we get our warmest weather in the fall. But so far the weather seems to be following a more typical cool spring pattern which I can't imagine will hurt them. 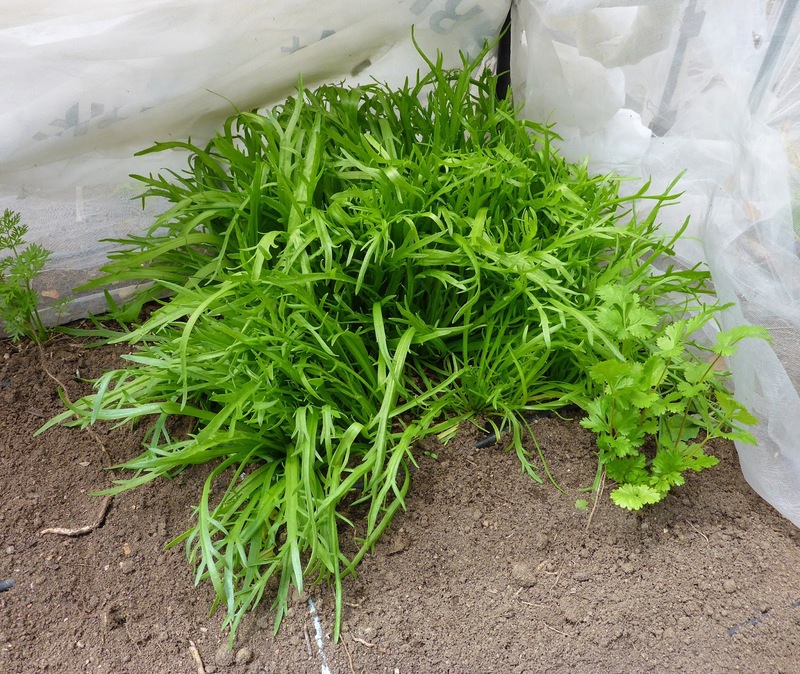 Here's a new salad green that I'm growing but haven't sampled yet, Buck's Horn Plantain (aka minutina or herba stella). I need to start using it before it bolts too. 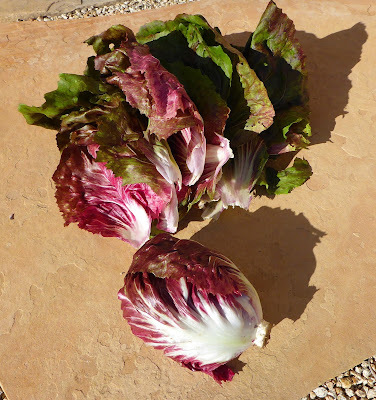 Here's an experimental sowing of Palla Rossa radicchio. 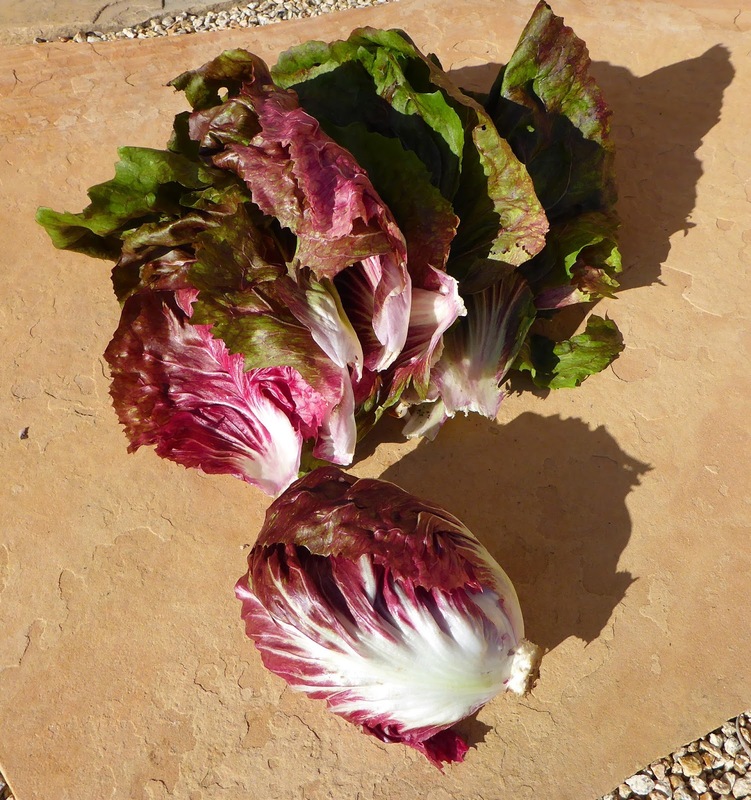 Radicchio is usually sown to mature in cool weather which intensifies it's red color and sweetens it also. Wild Garden Seed said in their description that this is one of the most reliable open pollinated varieties for spring sowing so I thought I would give it a try since spring and early summer tends to stay on the cool side here. So far so good, they look like they may be trying to form heads now. 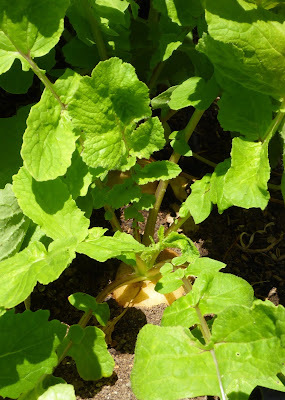 Here's my small patch of small turnips. I've got Mikado (white), Round Red, and Scarlet Ohno. 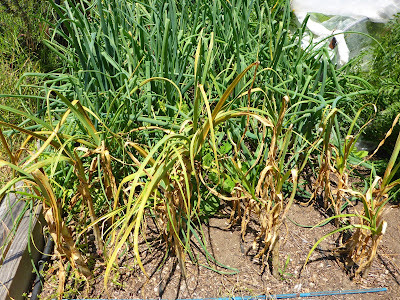 Scarlet Ohno is supposed to be grown as much for the greens as the roots. Unfortunately, one of the downsides to growing greens in a tunnel is that the aphids can get out of control easily, which is what has happened in the turnip patch. This year I got around to sowing carrots, just a small patch to try some new varieties. If I find some that I like I'll grow a larger patch of them for fall and overwintering. This lot includes Bolero, Nelson, Purple Sun, Pusa Asita Black, Pusa Rudhira Red, and Rotild. 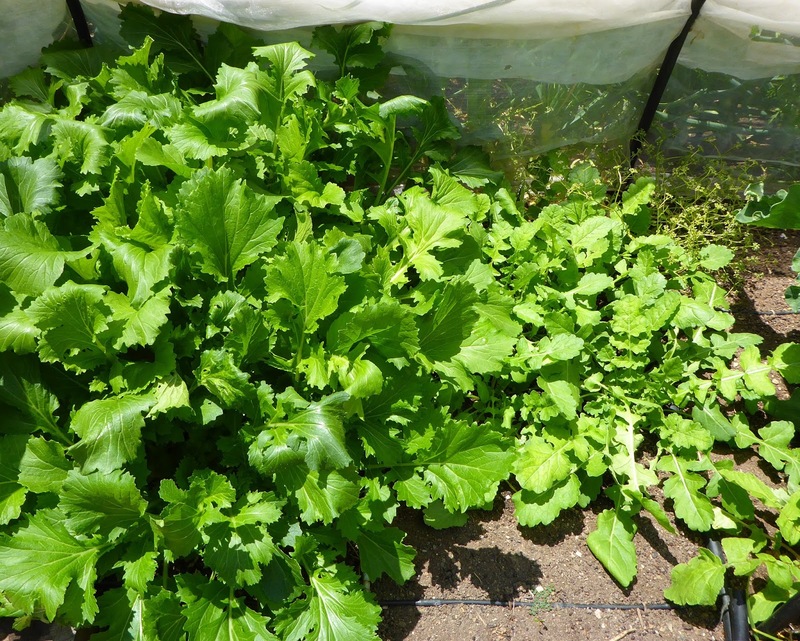 I've been pretty good at keeping succession sowings of radishes and arugula going. That's the latest sowing above along with some Baby Shanghai pac choi. That's pretty much it for Bed #1. I've got a Romanesco zucchini seedling started that I'll plant out in a day or so. 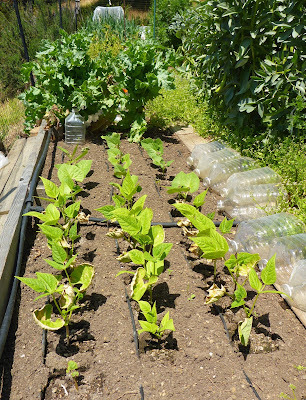 When the chard is well and done then I'll put up a trellis in that spot and plant a couple of Tromba d'Albenga squash. And then there's more little lettuce seedlings that I've started that will go into the empty spots in the tunnels. So now I'll show what's happening across the main path in Bed #4. 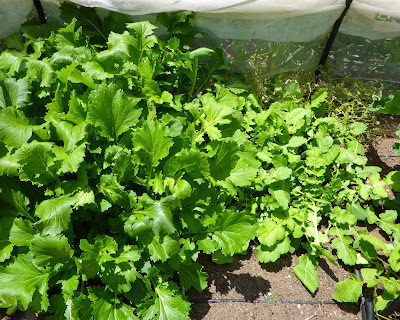 Back on April 1 I showed this corner of the bed just planted out with tiny seedlings of spring brassicas. They have really grown quickly, from just 3 or 4 little leaves to this in less than 6 weeks! 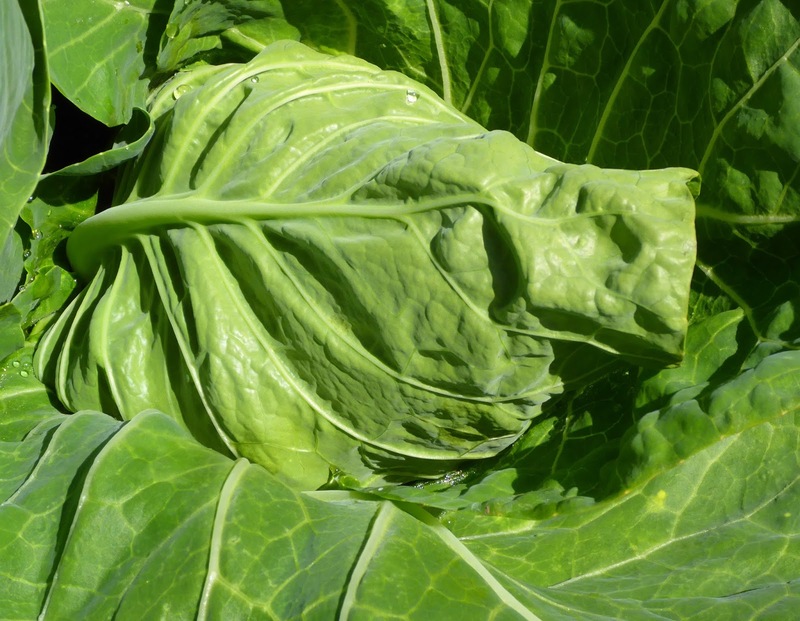 The cabbages even look like they are starting to form heads. 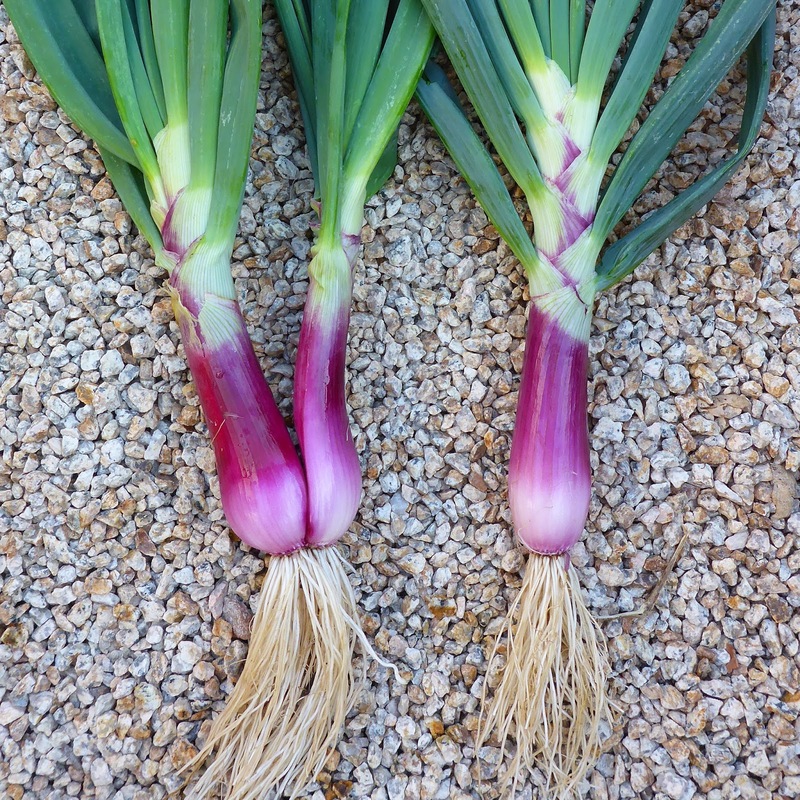 Both varieties are small headed, but still, that's quick. 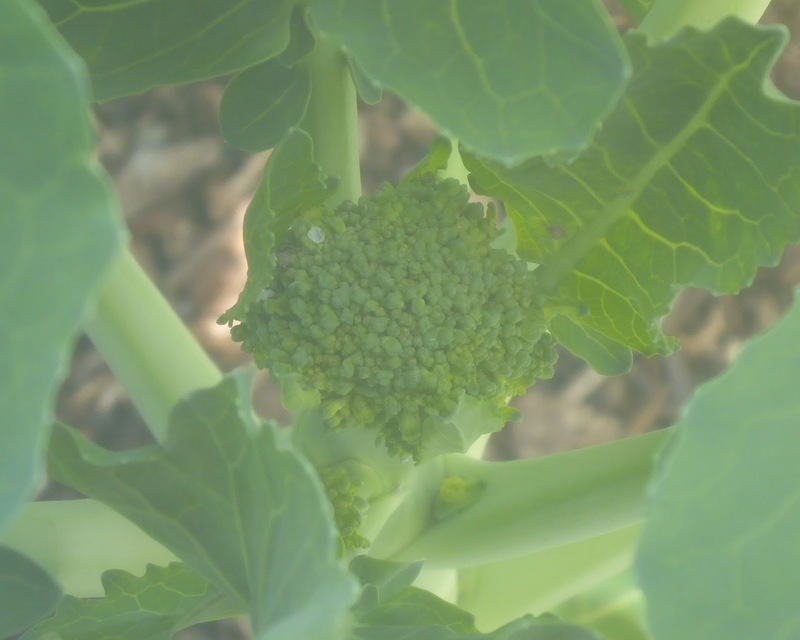 The cauliflower isn't showing signs of forming heads yet. I hope it doesn't misbehave like it did last spring and make buttons instead of heads. The Mizunarubasoi is a particularly enthusiastic grower. I've already thinned it out twice and it's still trying to elbow aside the more leisurely paced Cape Greko mustard. 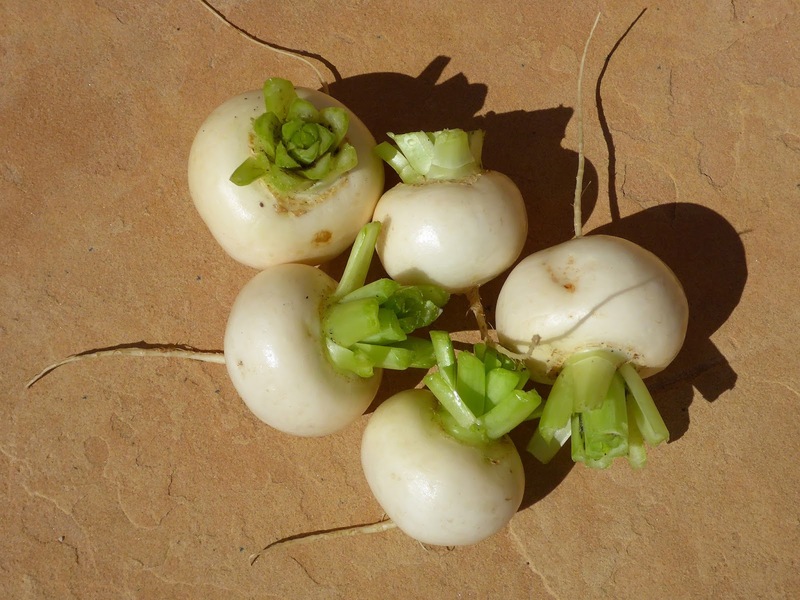 There's the previous succession of radishes sown along the edge of the brassica patch, already big enough to harvest, just in time since they are getting overshadowed already. There's a few I'itoi bunching onions planted along the very edge of the bed outside the tunnel. 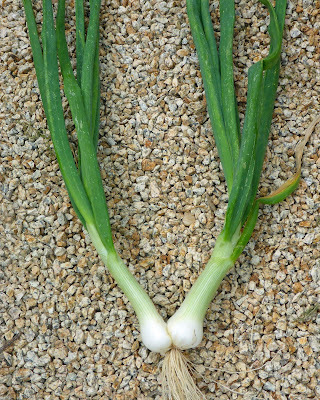 I ordered the bulbs for these onions last fall and when they arrived I was dismayed to find them to be almost totally desiccated. I planted them anyway and much to my amazement 8 of the 10 bulbs sprouted. 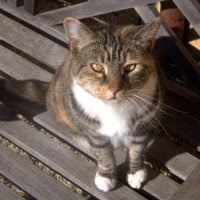 But then one of my cats (or the neighbor's) dug around in my pots so I ended up with only 5 scraggly little survivors. 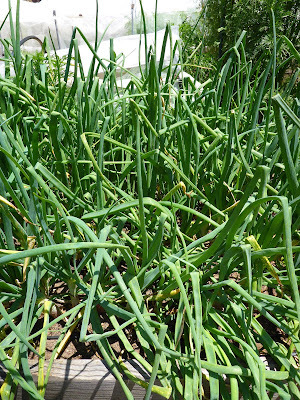 Not to worry though, these onions multiply like I wish my savings account would, they keep doubling, 1 bulb turns into 2, 2 into 4, 4 into 8, and so on. One grower in Arizona reports that 1 bulb can turn into 100 by the end of the season. Now I'm wondering if I gave those little things enough room. 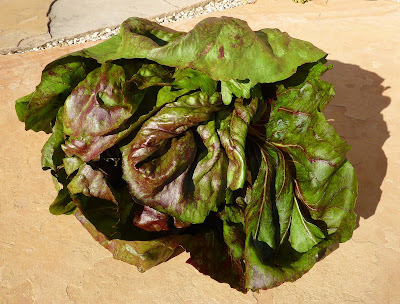 I'm trying a new chard this spring. 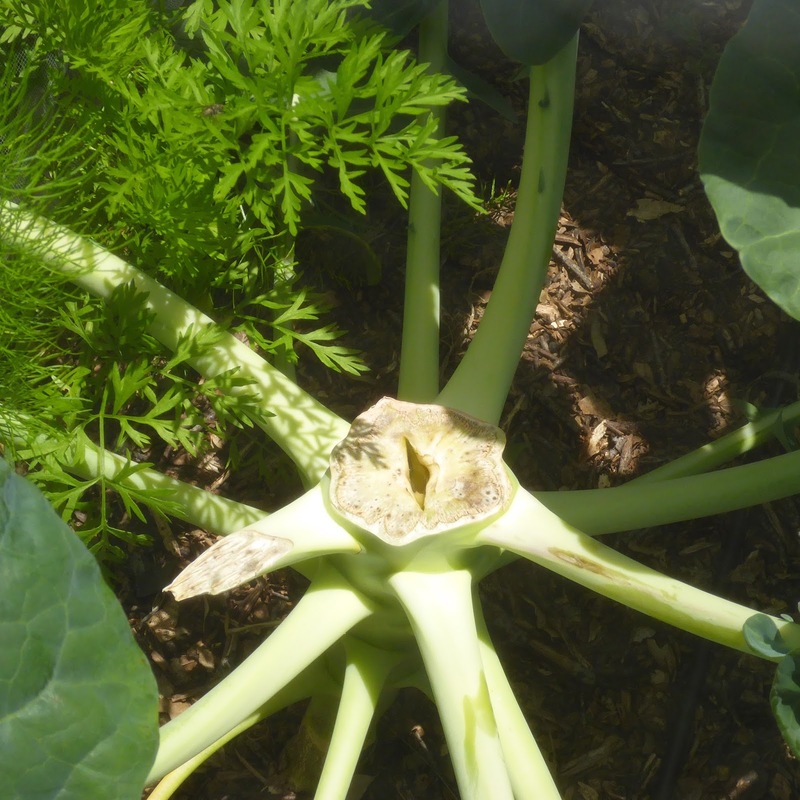 It's a very old heirloom and is supposed to be an annual rather than a biennial, producing flower stalks that are good eating. Harvesting the flower stalks promotes more so it's possible to get successive harvests. 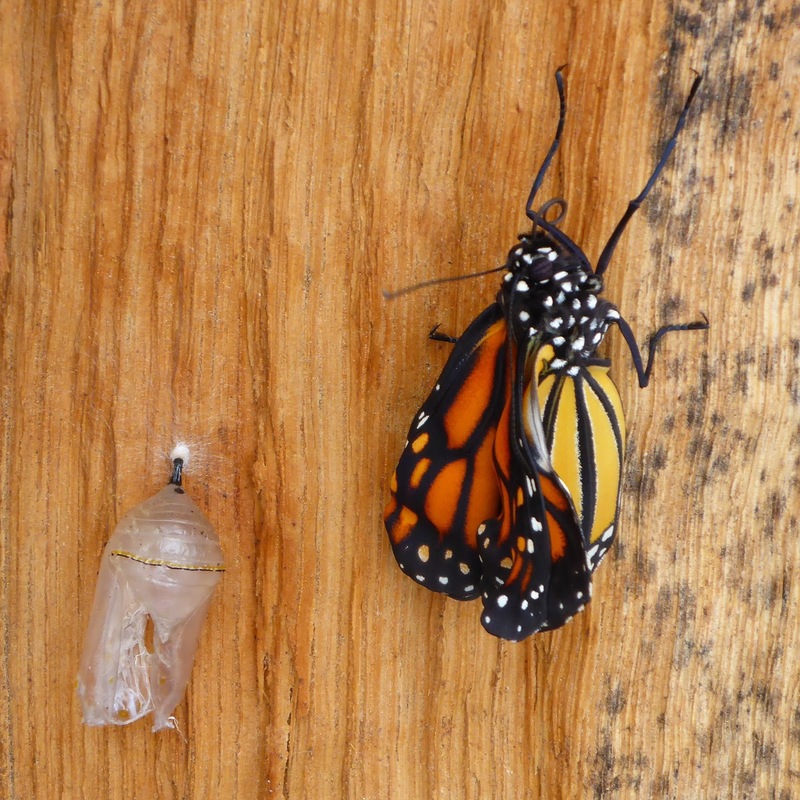 It will be interesting to see what it is like. So far it has leaves that look like a fairly typical green leaf chard, but the stalks are slender and green. I always try to have something blooming in the garden that is attractive to beneficial insects. That used to be Sweet Alyssum, I would let it volunteer all over the place, but unfortunately it is also hugely attractive to Bagrada Bugs. 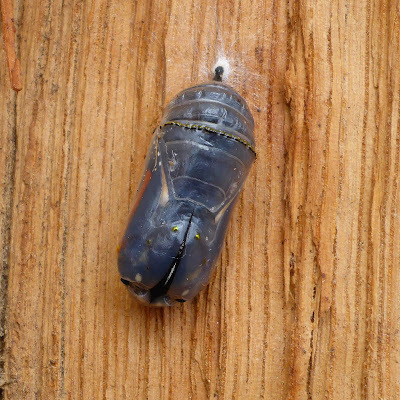 If you haven't heard of these bugs lucky you, it probably means that they haven't found you, yet. They are nasty critters and since they are foreign invaders they don't have any natural enemies here. Anyway, my easy substitute for Sweet Alyssum these days is plants in the Apiaceae family (formerly Umbelliferae), including cilantro, parsley, fennel, dill, carrot and such. It's so easy to let cilantro bolt and the good bugs love it! 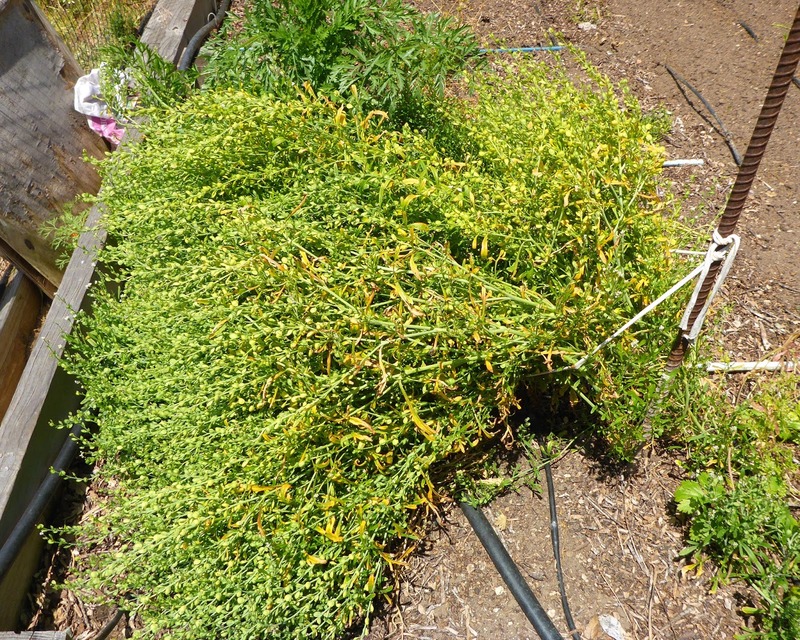 It takes up a lot more room than Sweet Alyssum, but it is well worth the space to let it go in a few spots around the garden. 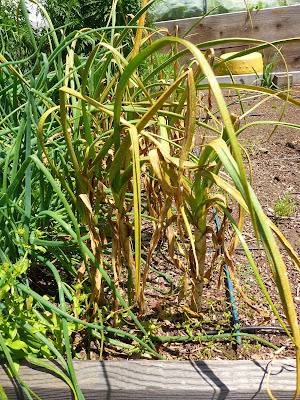 Ugly, ugly, ugly, oh so ugly rusty garlic. This is the last of it which I've not gotten around to pulling. Thank goodness the shallots and the onions aren't so susceptible to the rust. 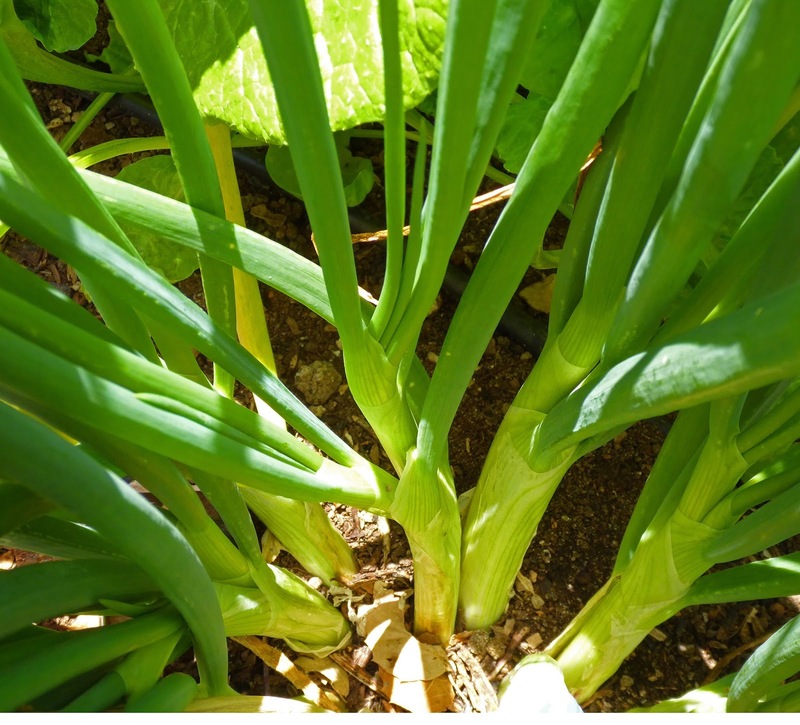 The shallot leaves have a touch of it but it's not enough to worry about. 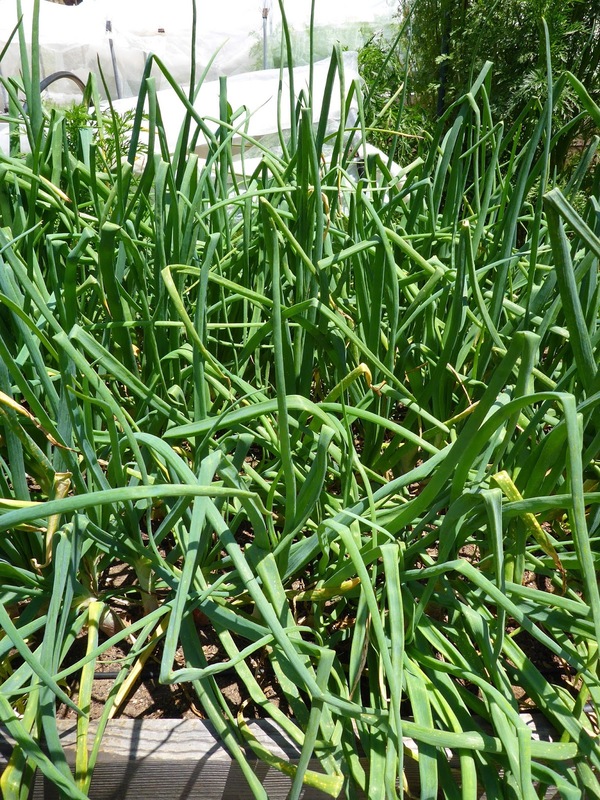 The onions are standing tall and green, no sign of bolting yet, but a few are dividing. I grew the broccoli under a tulle cover this spring, mostly because of the birds. 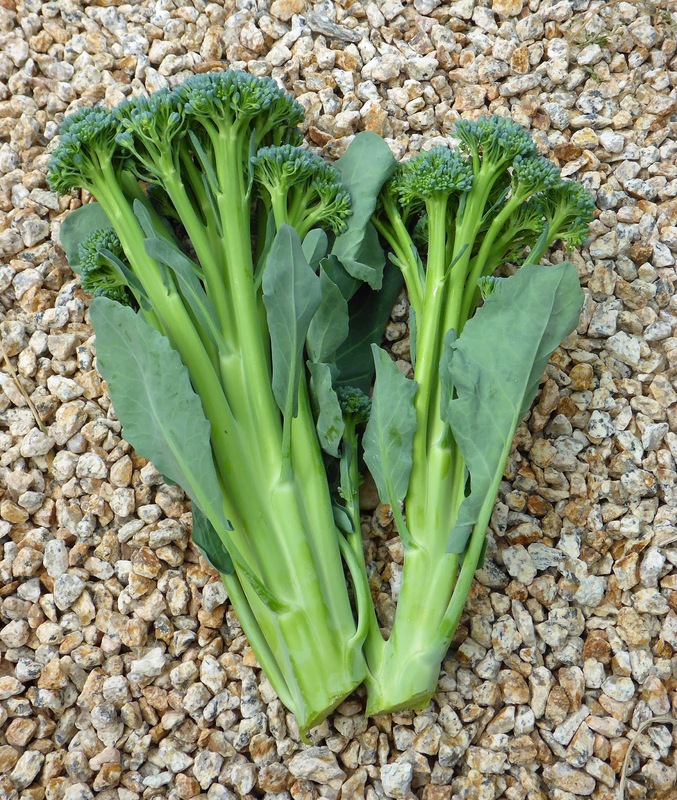 Both heads of Batavia broccoli have surrendered their main heads, one has some nice side shoots and the other one so far isn't showing any signs of shoots. I'll wait and see. The Atlantis brokali is starting to develop some main heads. 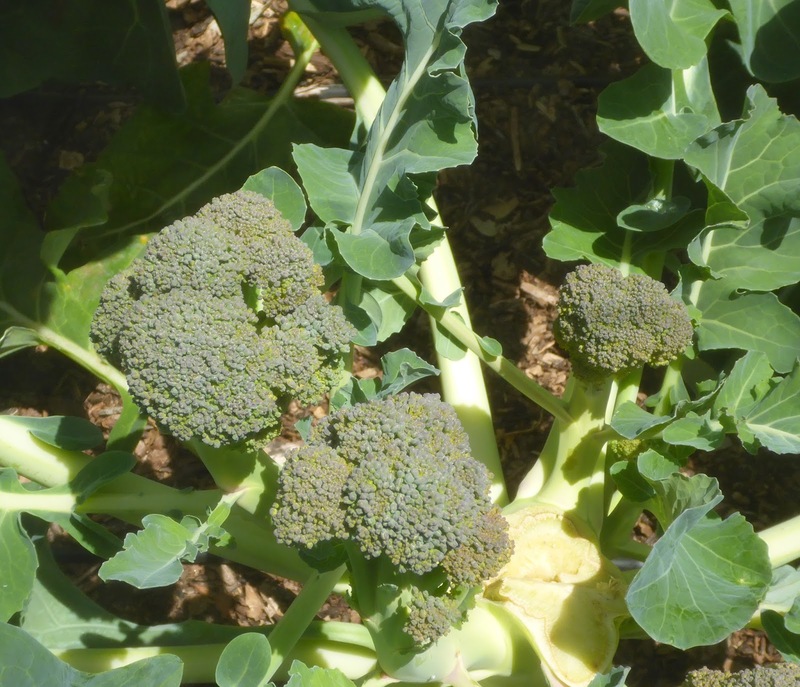 These will be a nice succession after the Batavia broccoli. Off in another corner corner of the bed are a few Pink Plume celery plants. These are an unusual pink stalked variety that I'm trying for the first time. 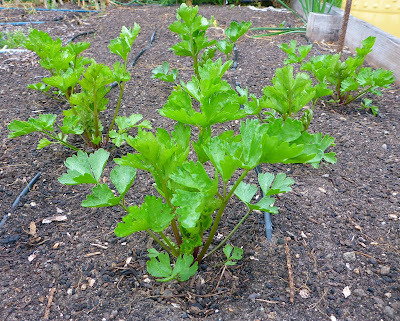 I usually grow celery in the fall and through the winter, I haven't tried it in the spring, so I'm sure how these will do, but I couldn't resist giving them an early try. 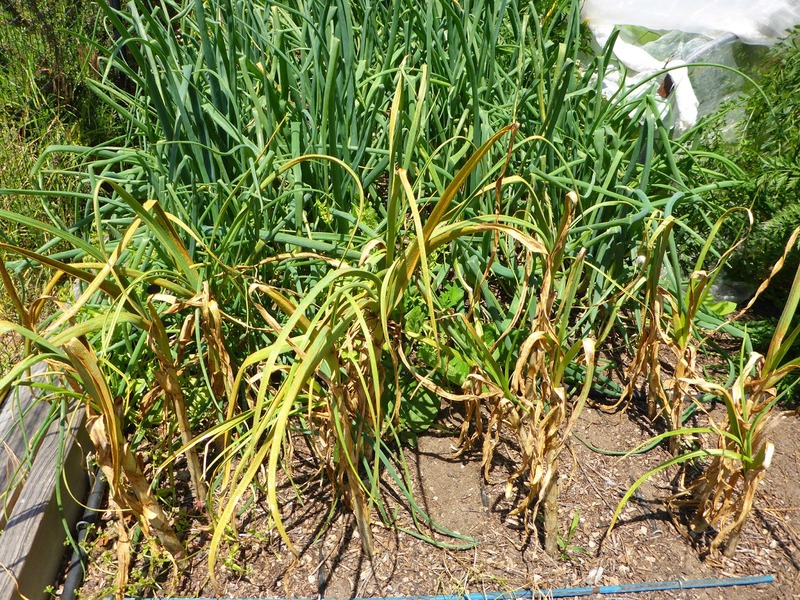 The only other thing left in this bed are a few plants of Rishad cress that I had sown between the garlic. 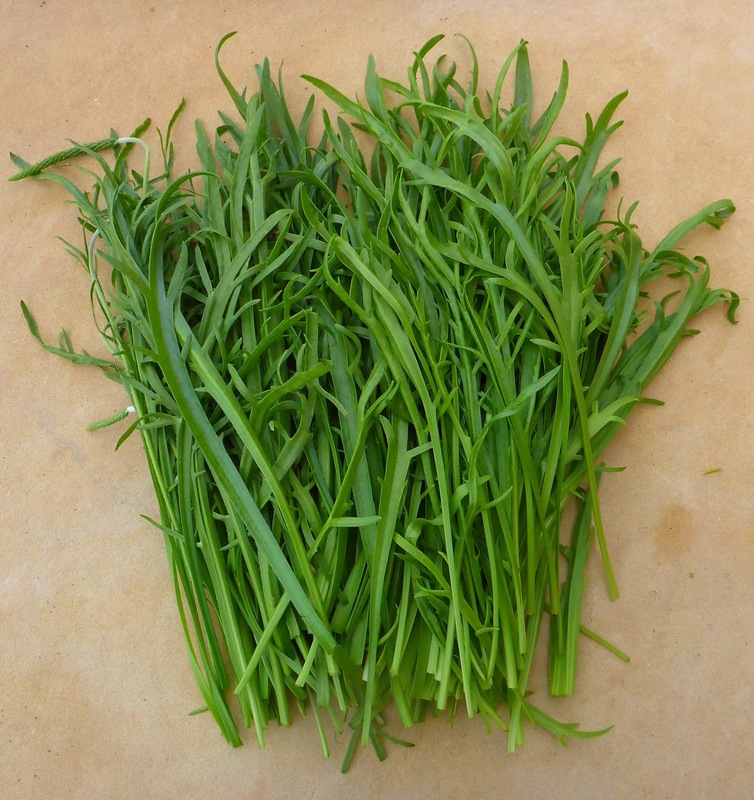 When the garlic starting failing because of the rust I decided to not harvest the cress but let it go to seed. I'm going to have a few years supply of seed now. 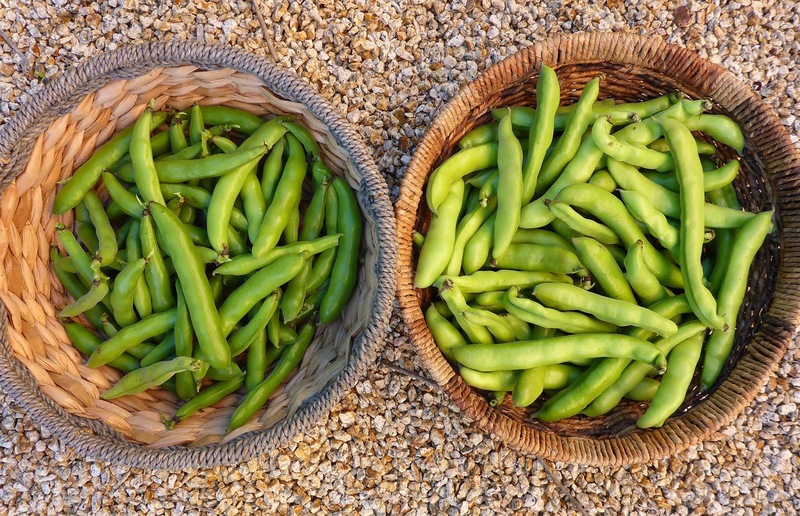 Bed #3 is dominated by favas right now. The trellis is where I trained the tomatoes last year and I left it in place to tie the favas to as they got tall. I'm liking the trellis as a way to keep the favas under control, it is very easy to take a long tie (strips of old t-shirts) and loosely gather together the shoots of an individual plant and tie them back. I used to grow them inside my big tomato cages, but when I switched from cages to a trellis for my tomatoes last year I decided to stick with the trellis for the favas. 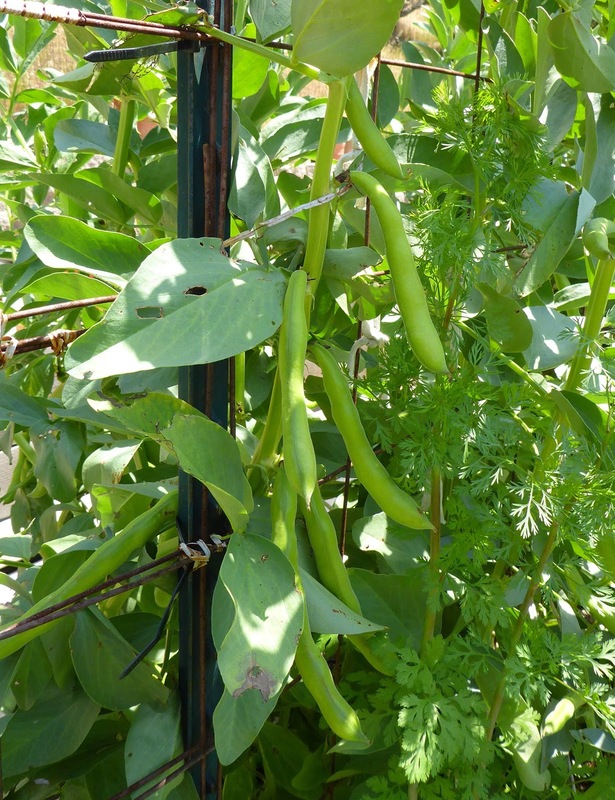 Not only is it easy to tie up the fava plants, but it's easier to harvest the beans as well, it was always awkward reaching through the mesh of the cages to get to the beans which is not a problem anymore. 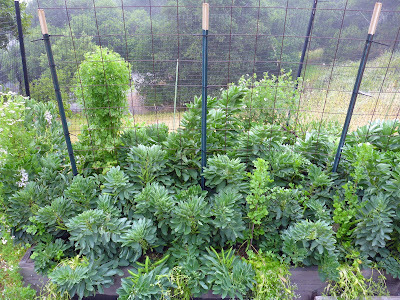 Compare the photo above and the photo below, you can use the posts supporting the trellis as a gauge for how tall the fava plants are. Look how short and bushy the Robin Hood plants are below. 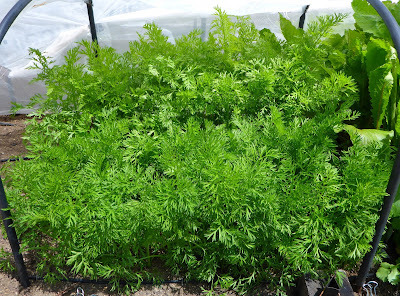 I've never seen fava plants like that, most of them are only about 2 1/2 feet tall, and a few are about 3+ feet tall. 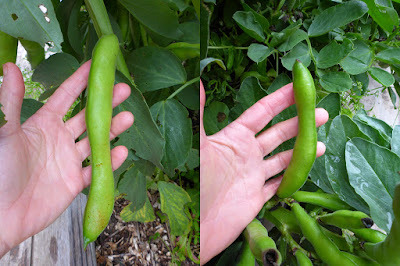 Here's another comparison of the stalks with the pods. 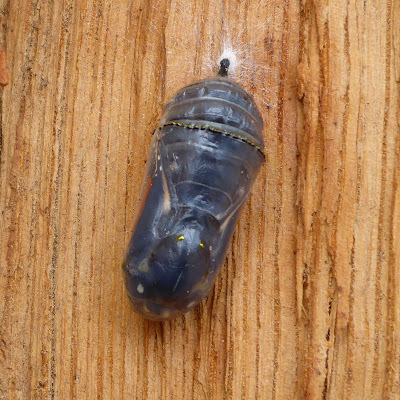 And one more comparison shot, the size of the pods. What the Robin Hood beans lack in size they make up for in quantity. 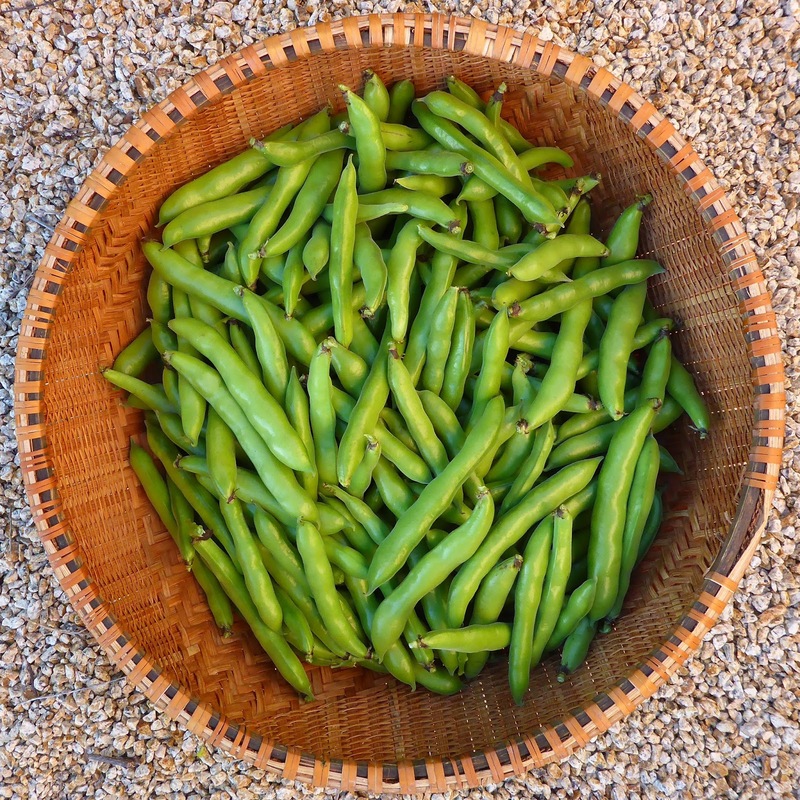 There's just a couple of things about Extra Precoce Violettos that I prefer over the Robin Hoods, the beans mature earlier and the pods are easier to shuck since the beans are more loose inside the pod. The short stature of the Robin Hood plants (was Robin Hood a short guy?) is nice but they do flop a bit and are too dense to tie up so that's a minor negative. They are both really nice beans. 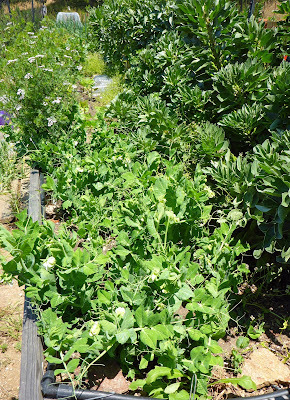 On the other side of the bed I planted a small patch of shelling peas. It's been many years since I tried shelling peas so I wanted to see how they do. This bunch won't produce a lot, but if I like the results and the timing works ok I may try a larger patch next year. You can see in the photo how the Robin Hood beans are encroaching on the peas, but the peas just grow out away from the beans so for now it is ok. I am finally coming to the end of the tour. Here's some bush beans getting off to a slow and rocky start. 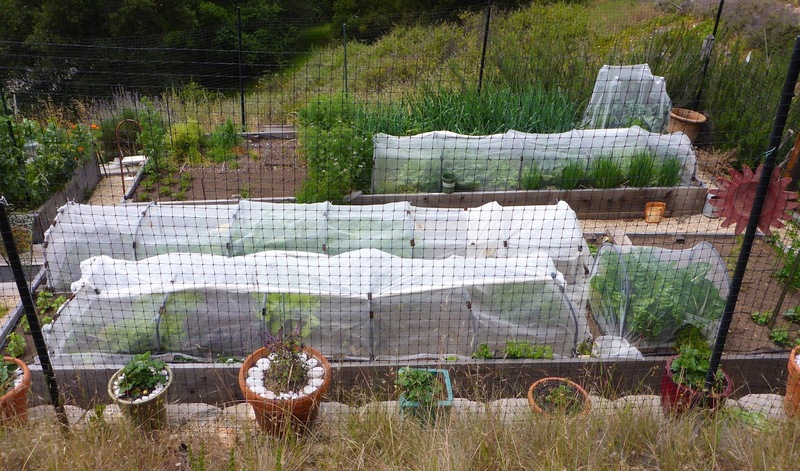 I initially set them out under cloches but that didn't work out so well, the first leaves got fried but most of the plants survived. 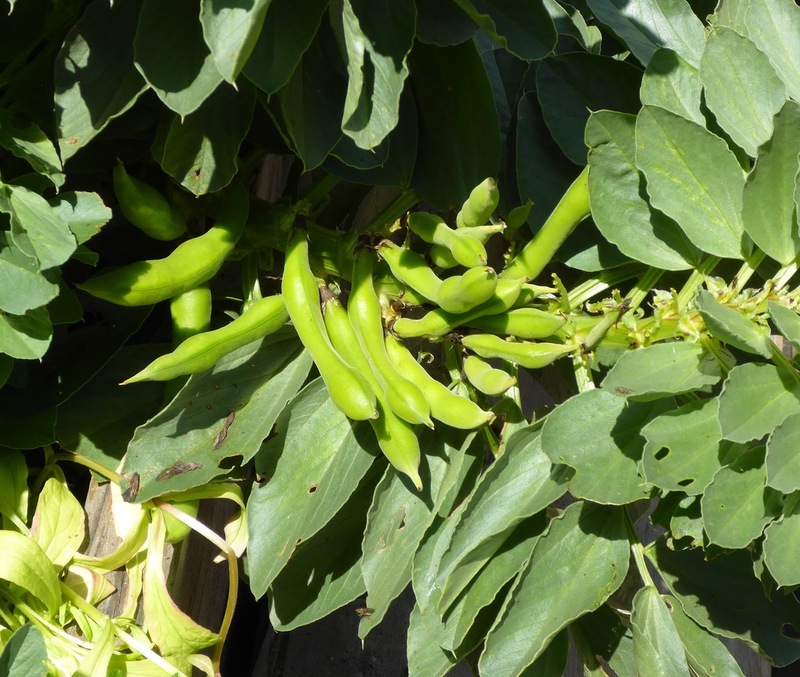 Above is a mixed bunch of snap beans including Red Swan, Roc d'Or, Royalty Purple Pod, and Rolande. The beans shown below are all Black Coco dry beans. Beyond the beans are a couple of volunteer Monticello poppies that I allowed to stay for a while, perhaps they will show off some beautiful blossoms before I have to pull them out. 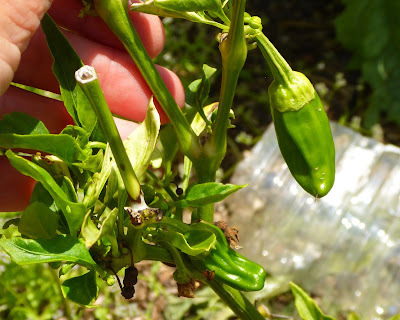 And one last item at that end of the bed, an overwintered Padron pepper. It survived and is even blooming but doesn't look very good, the leaves are just not growing and the peppers that have developed don't look great either, they probably didn't pollinate properly. The plant won't be there much longer. 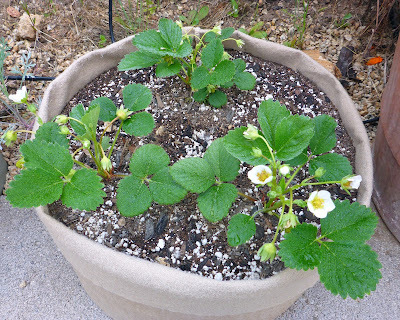 my latest experiment with growing strawberries. I'm trying them in fabric pots this year. I really want to taste a Mara des Bois strawberry and the only way it seems that that will happen is if I grow them myself. 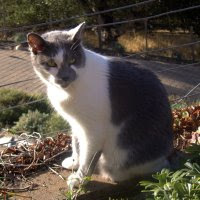 I tried once before back in 2011 but was foiled the ravenous appetites of rats. The rats that year were so bad that they were eating everything, including the wiring in my car. 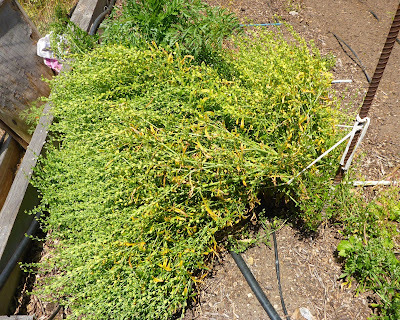 They did such damage in my strawberry bed that I ripped out every single plant, crying as I did so. It took me a couple of years to get over my fear of growing rat candy again but my experiments with growing them in my veggie beds were not as successful as I liked. Last year my best berries came from some plants that I had put into containers since I didn't have enough room in the bed for all the plants that I had purchased. 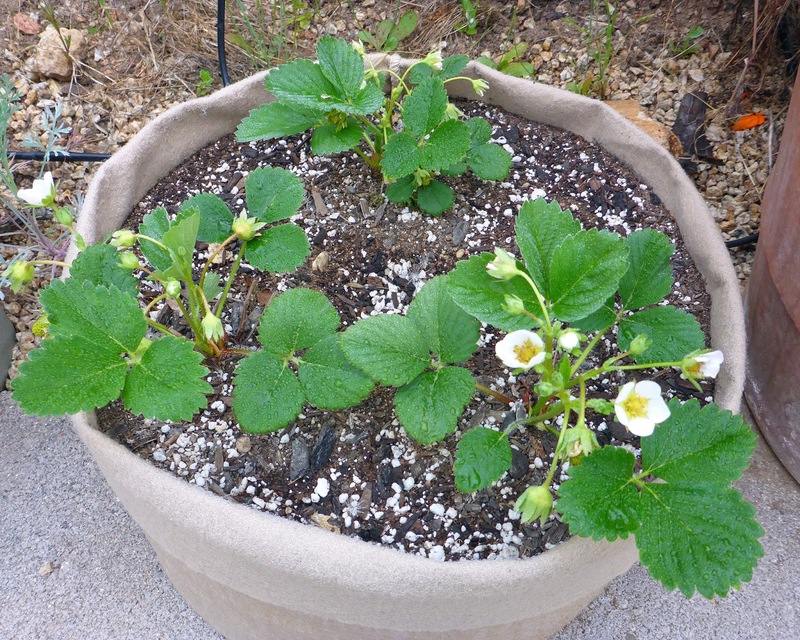 So this year I put all of my strawberry plants in containers. One last parting shot for those who stuck it out to the end of this long post. 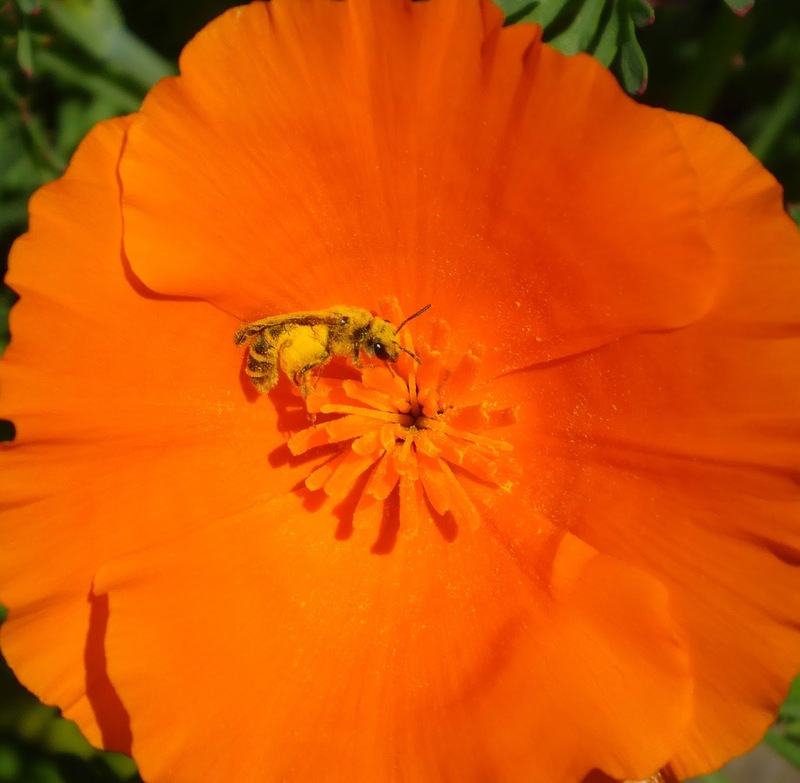 This native bee spent a lot of time working over this poppy blossom. If you want to see a short video of this beauty at work, um, head on over to Instagram - you'll find me there as @cvveggie.